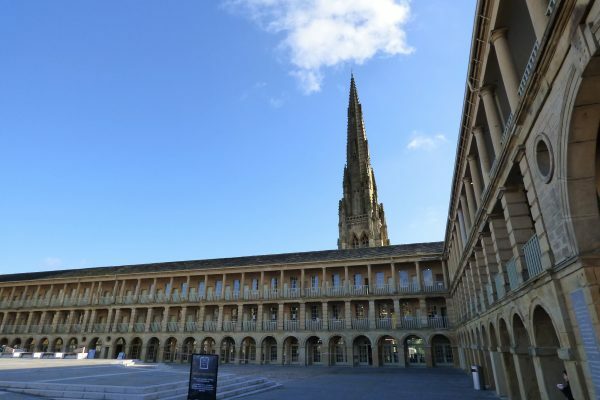 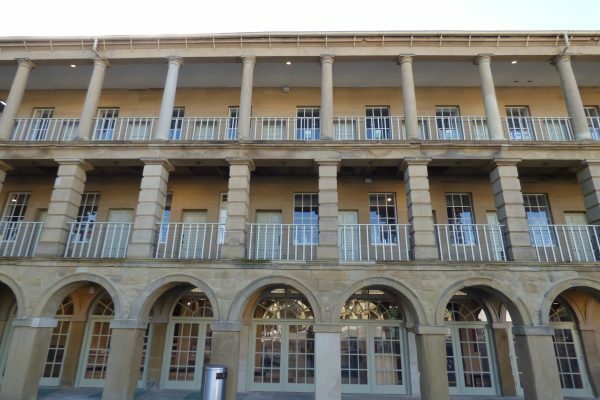 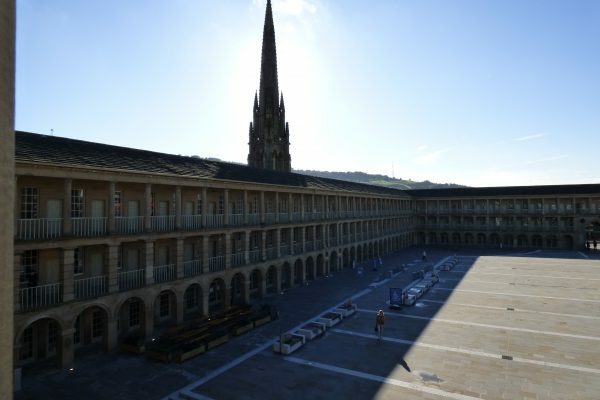 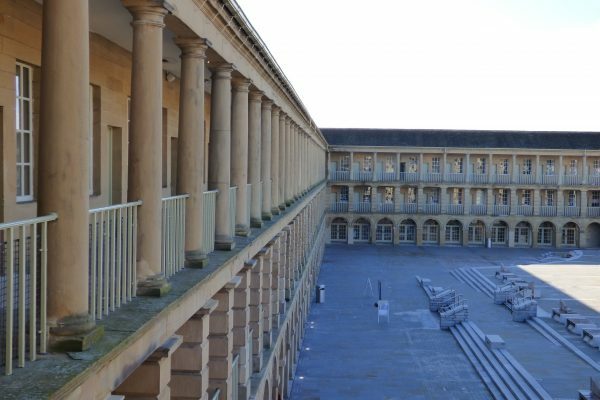 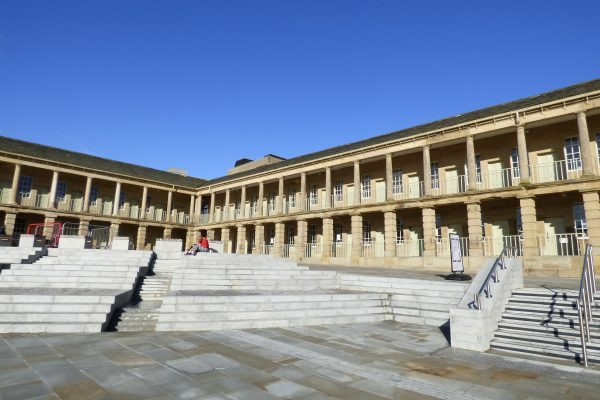 Following a major renovation, Halifax’s magnificent 18th century cloth market – The Piece Hall – reopened in 2017. 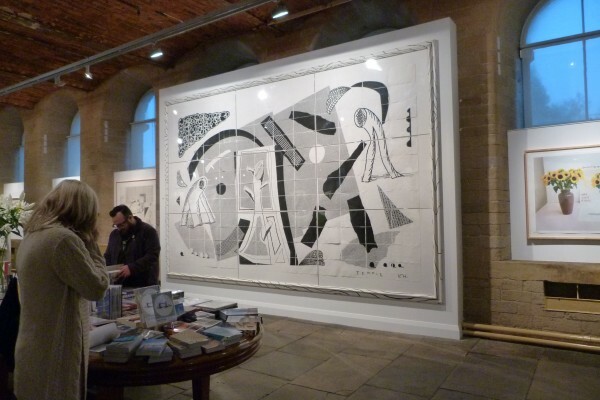 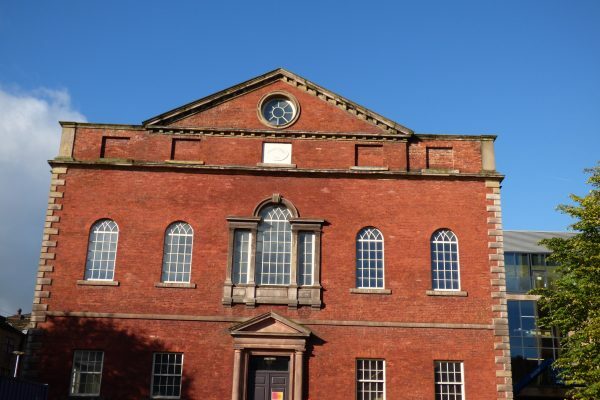 Originally built in 1779 as a market hall for merchants selling hand-woven woollen and worsted cloth produced by independent yeoman clothiers from the surrounding area, this spectacular Grade I Listed building is an architectural masterpiece. 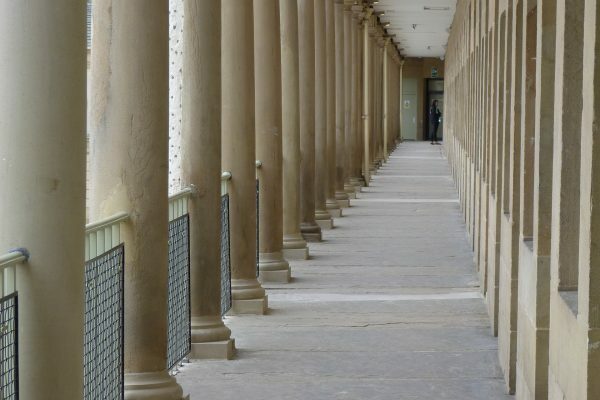 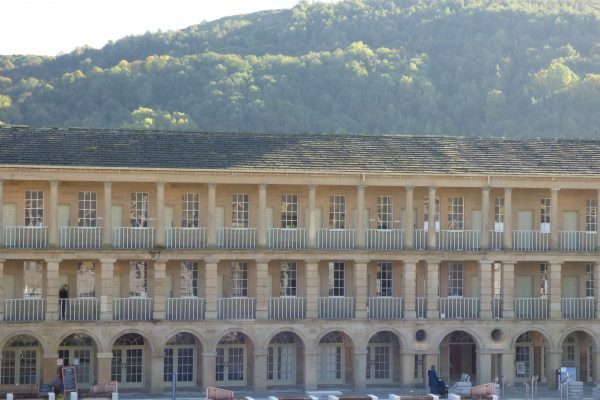 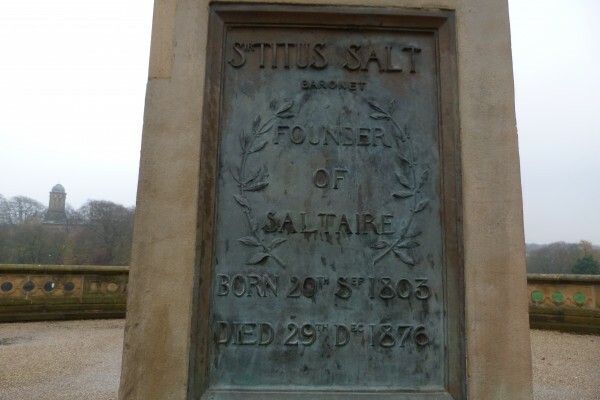 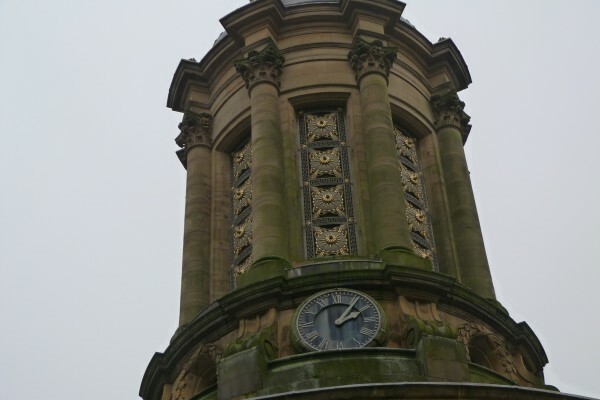 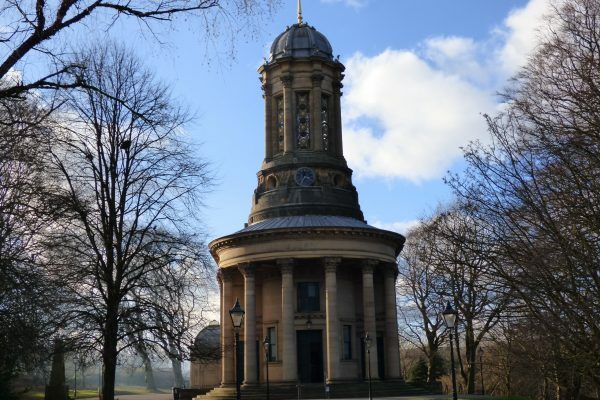 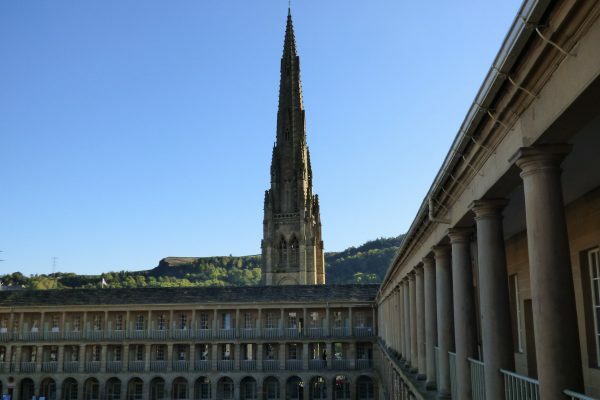 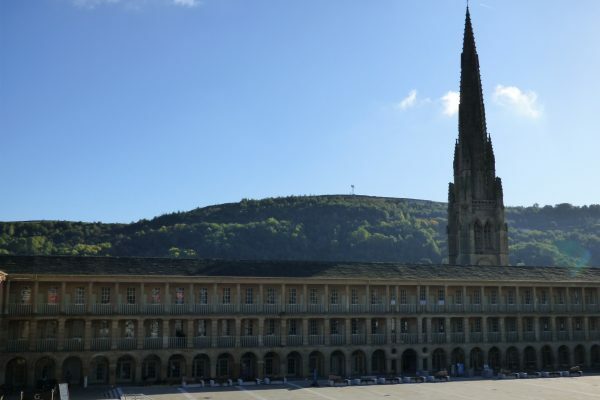 Constructed from fine-grained local sandstone with a stone slate roof, the Piece Hall is the most significant surviving monument to the domestic textile industry in Britain. 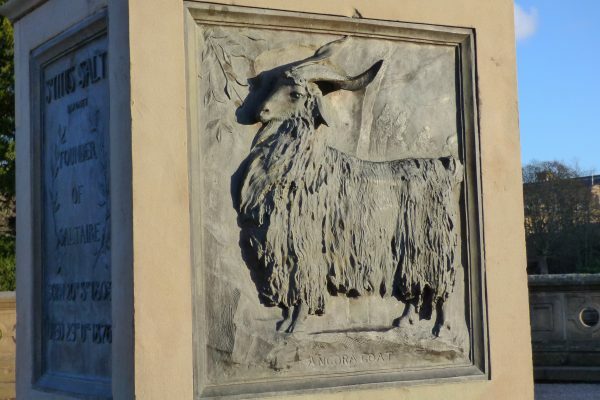 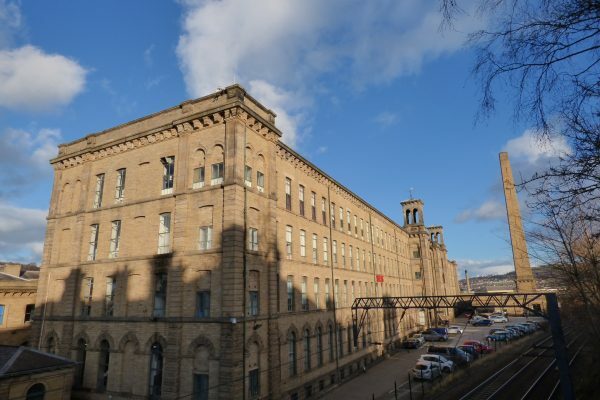 The building takes its name from the 30 yard lengths of cloth, known as ‘pieces’, which were the mainstay of its trade, along with raw wool. 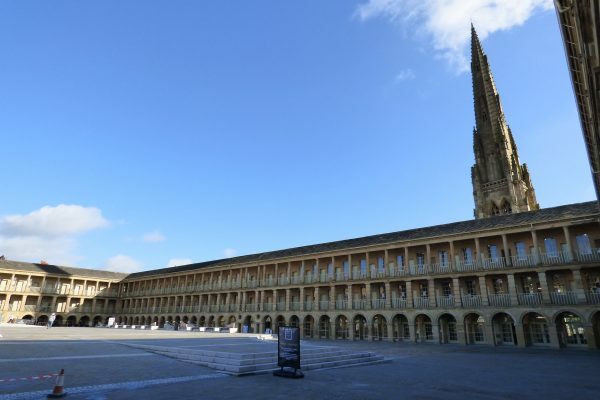 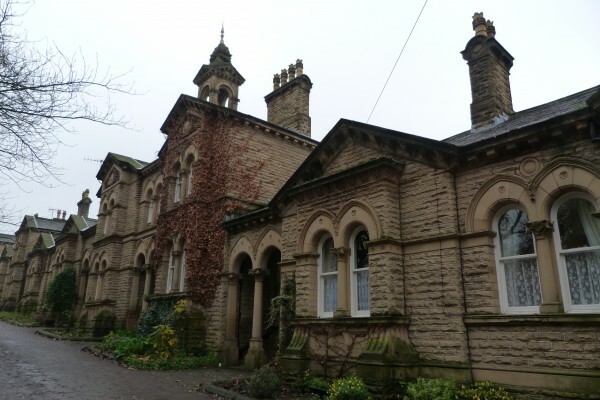 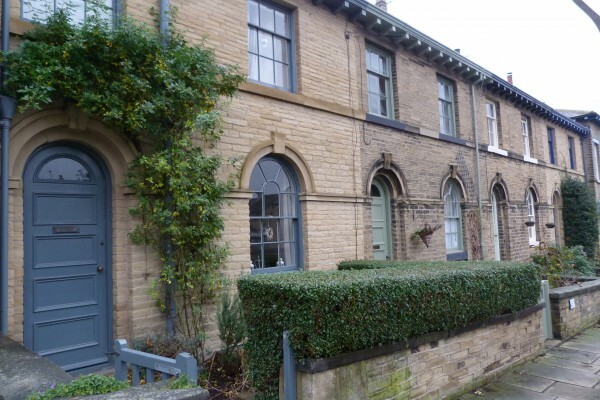 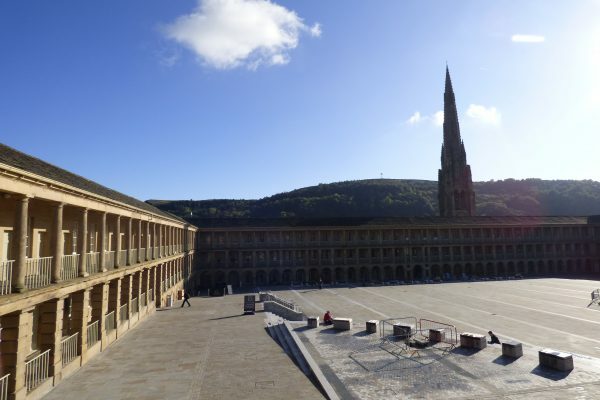 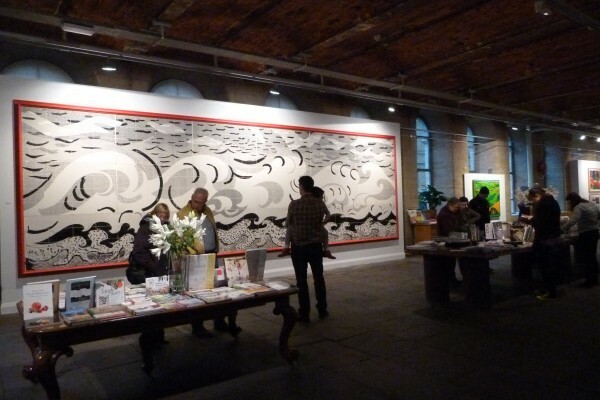 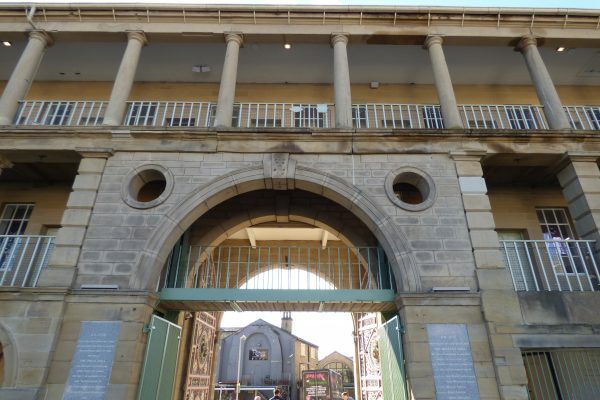 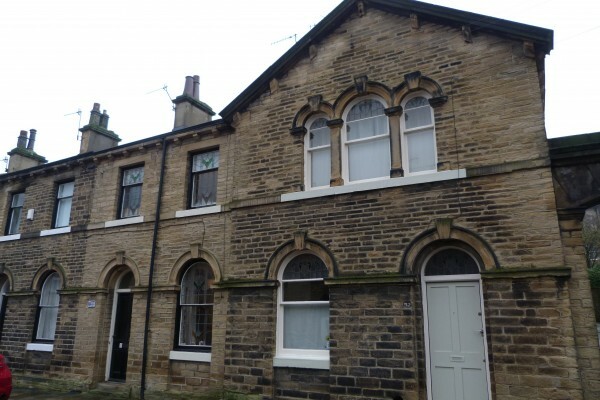 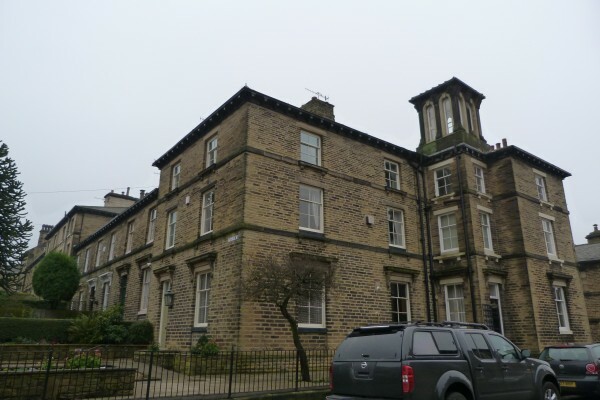 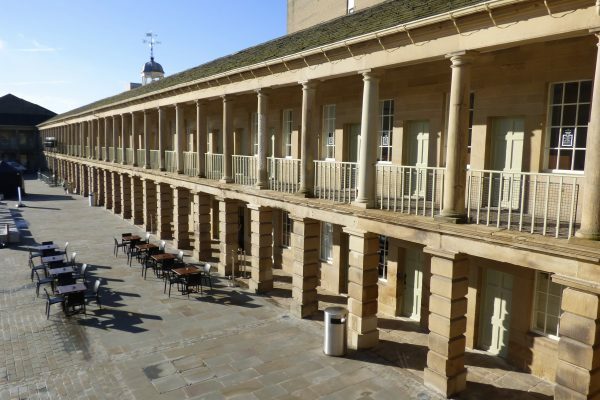 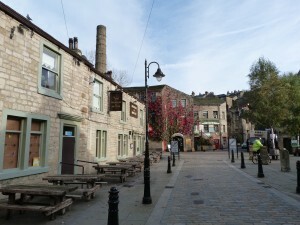 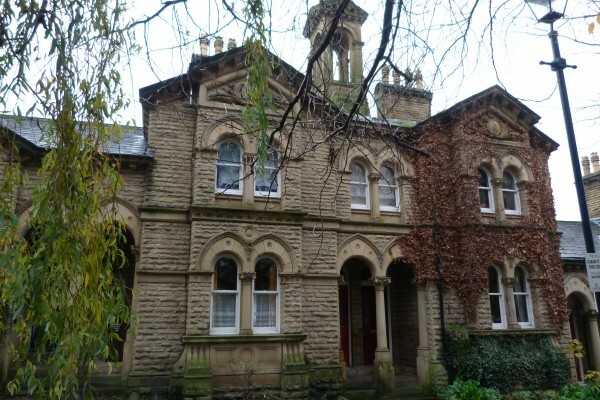 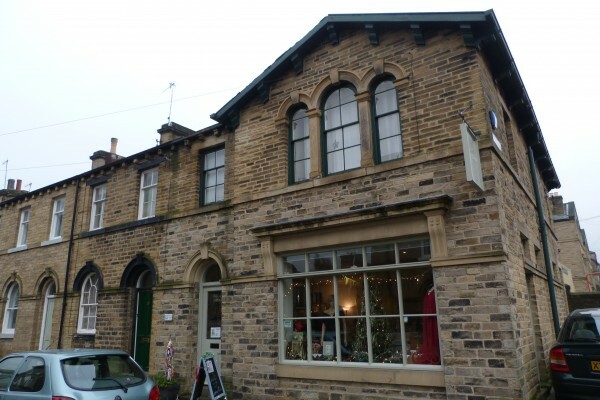 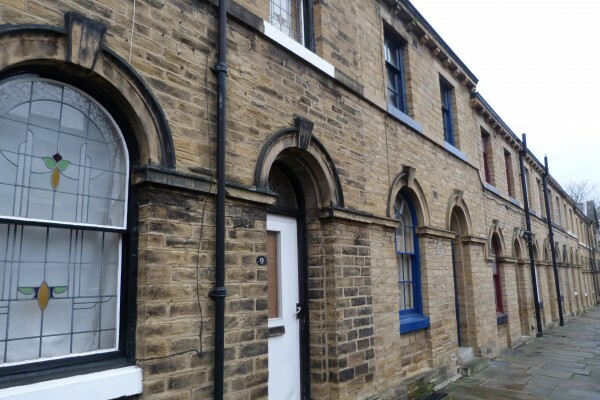 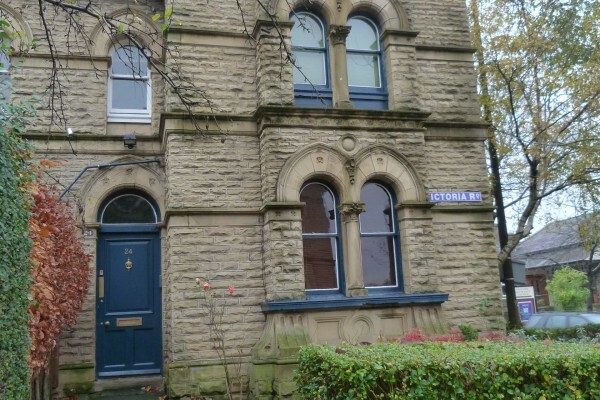 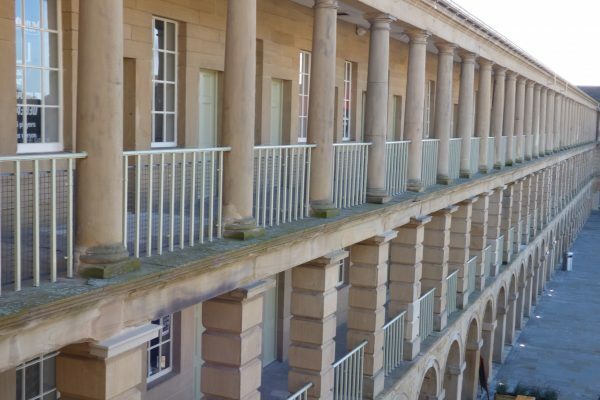 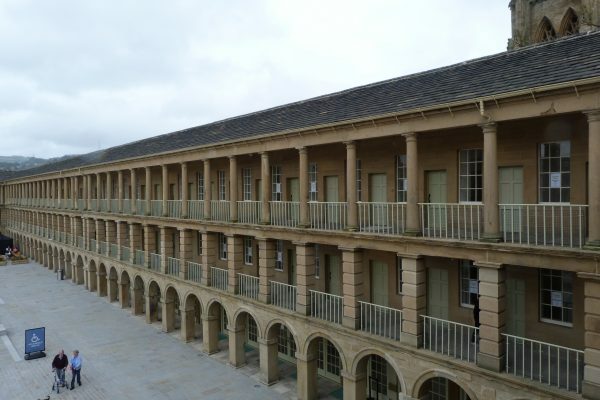 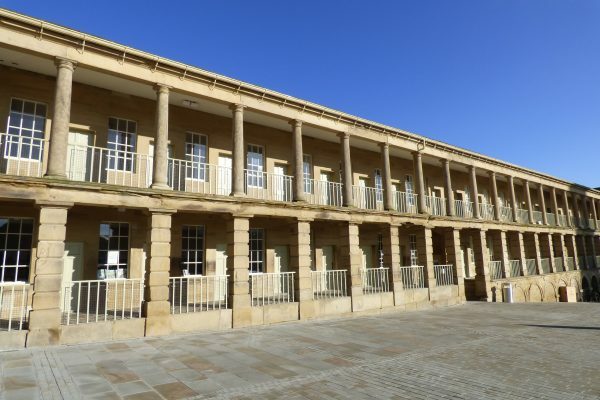 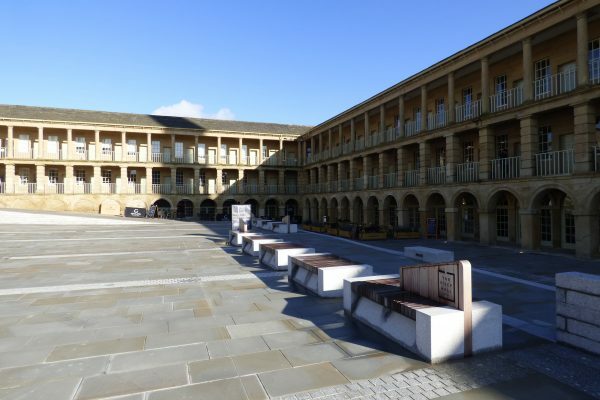 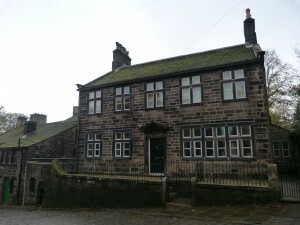 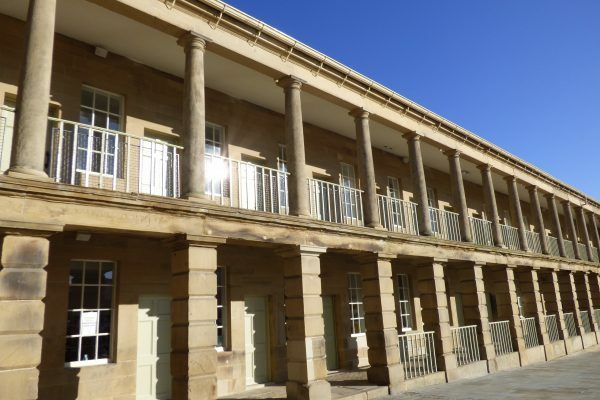 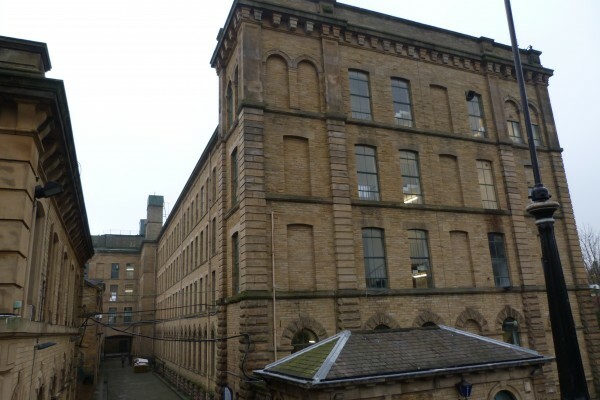 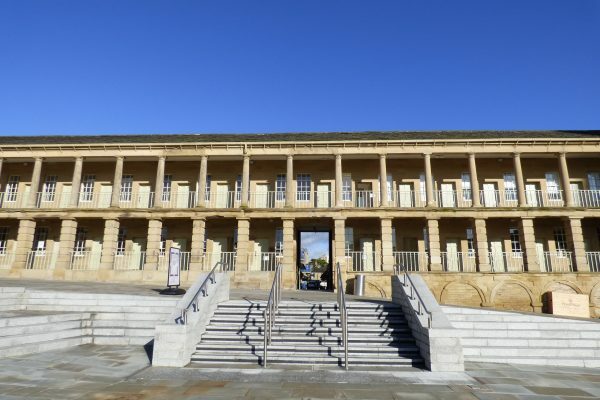 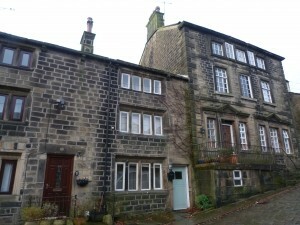 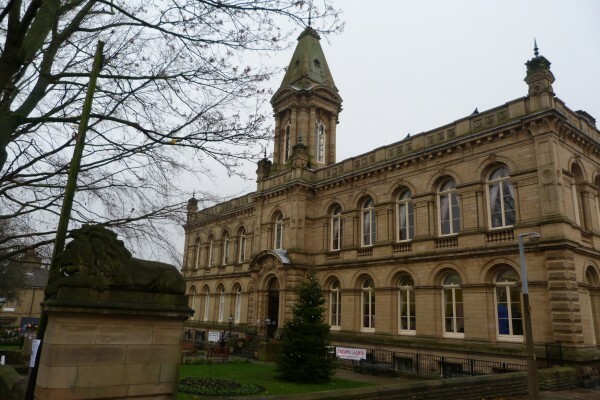 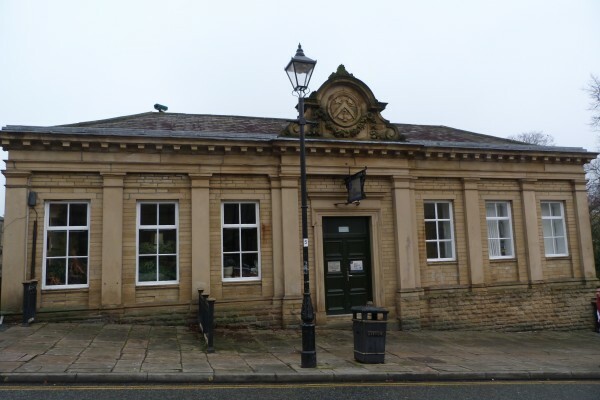 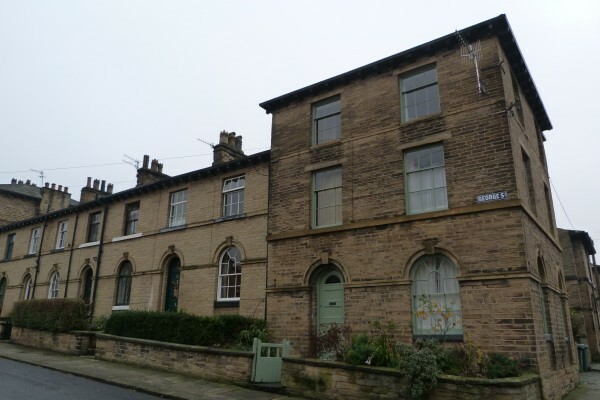 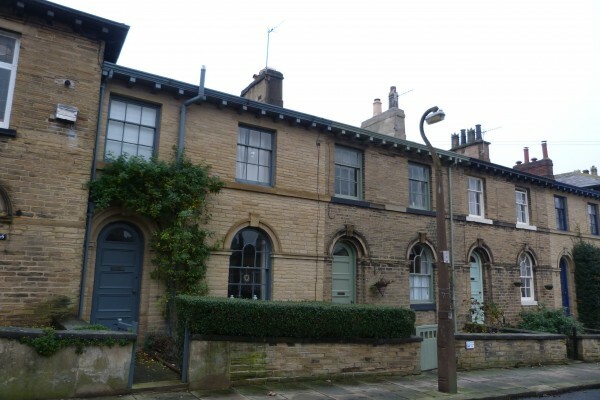 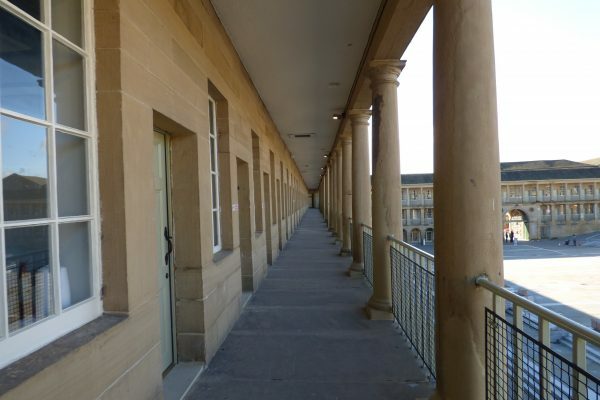 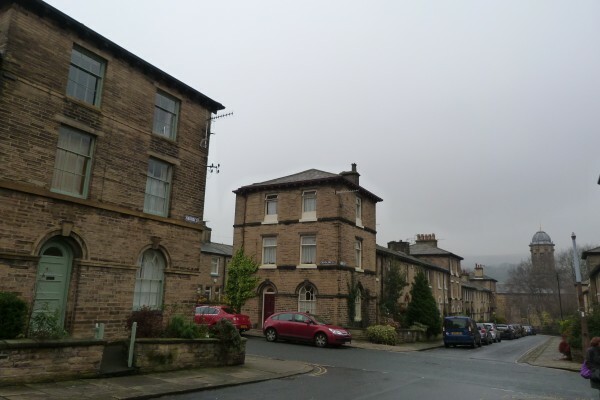 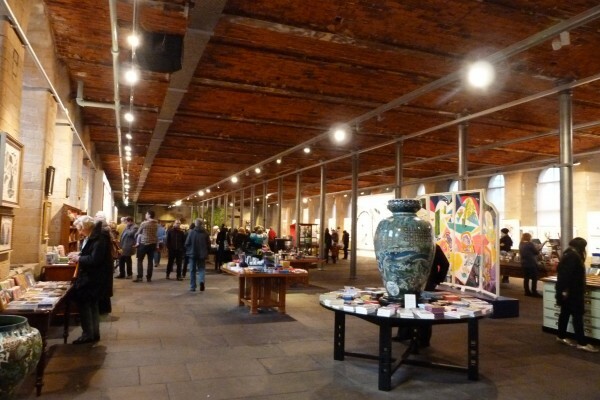 A large rectangular building housing 315 small rooms, the Piece Hall is believed to have been designed by Thomas Bradley, a Halifax architect and builder who was Surveyor for the Calder Navigation Company. 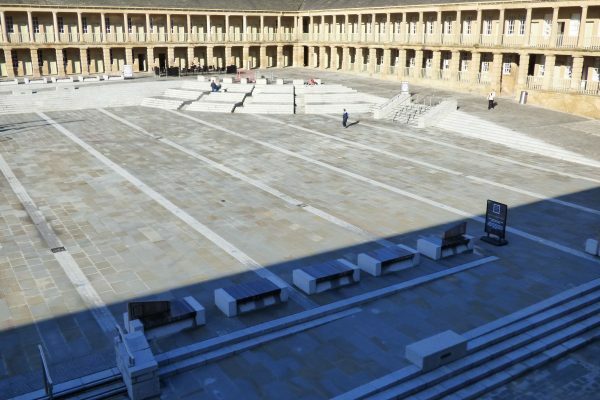 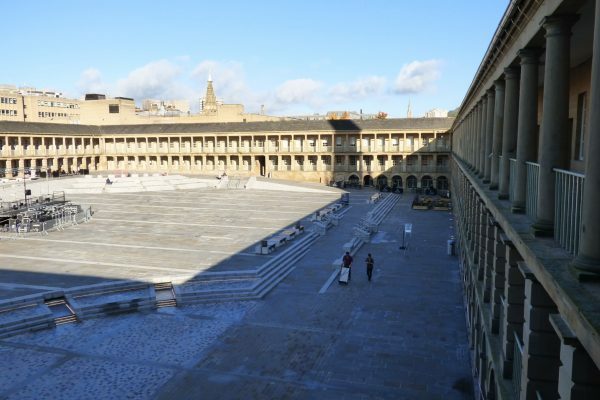 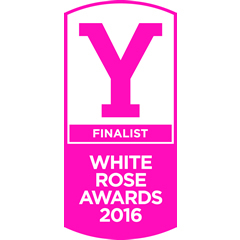 Taking the form of a quadrangle, the Piece Hall has a large open square in the centre measuring approximately 110 yards by 91 yards. 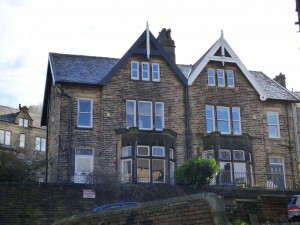 Constructed on a slope, the western side has a ground floor with one upper storey, while the east face is on three levels, with internal staircases at each corner. 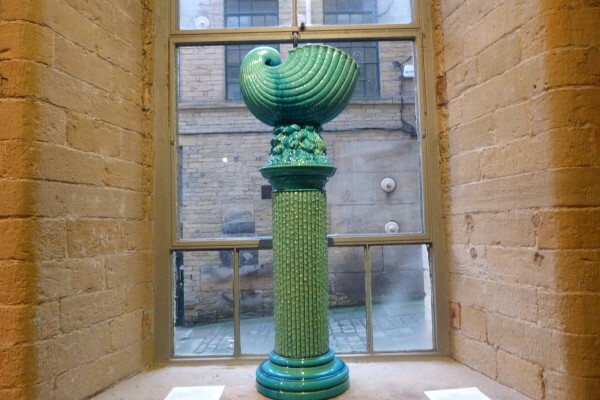 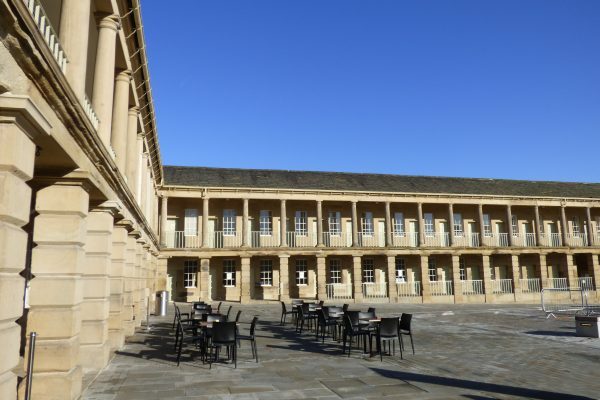 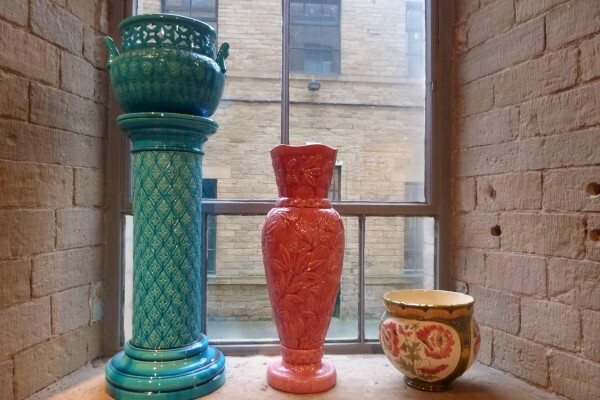 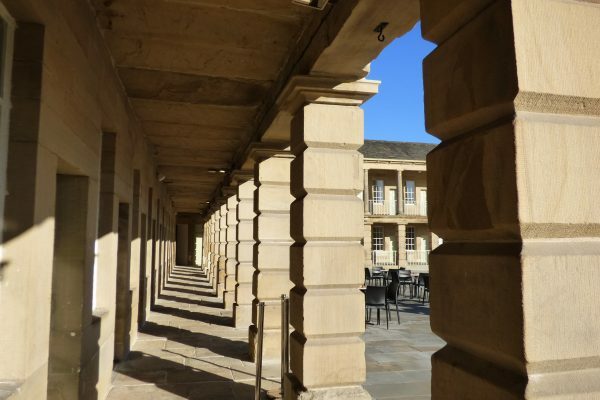 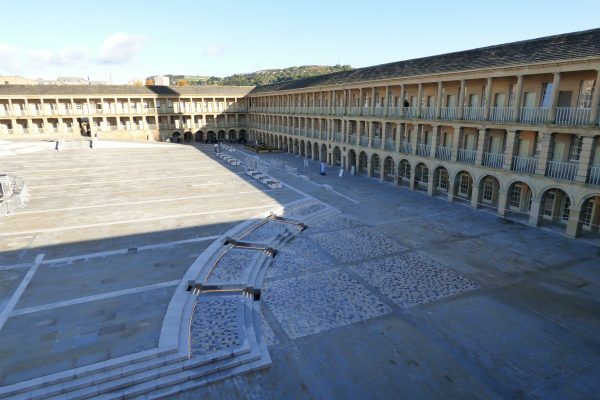 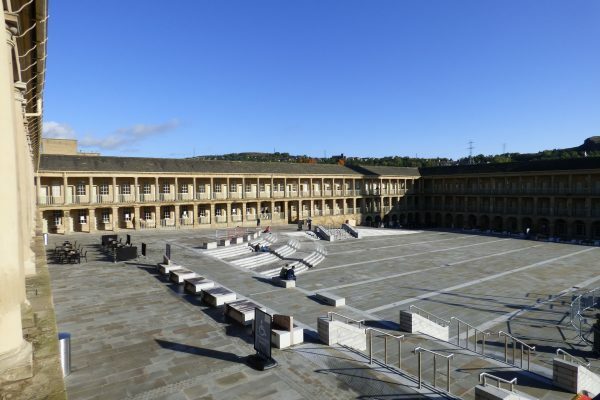 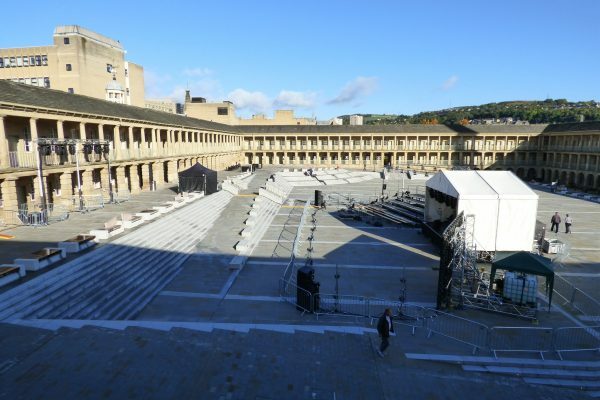 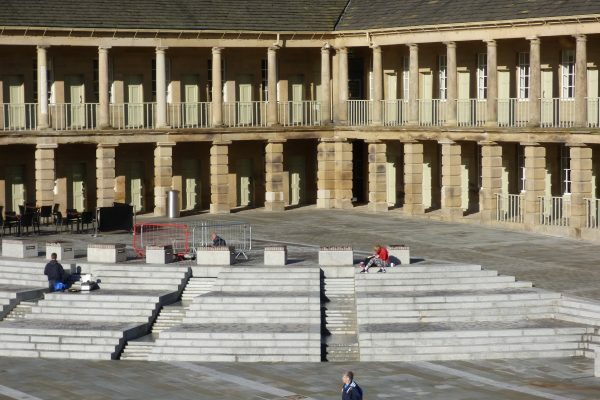 Classical in style, the Piece Hall draws inspiration from Roman and Italian Renaissance buildings. 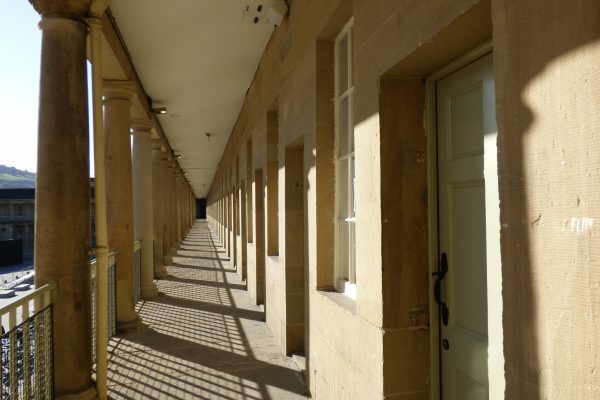 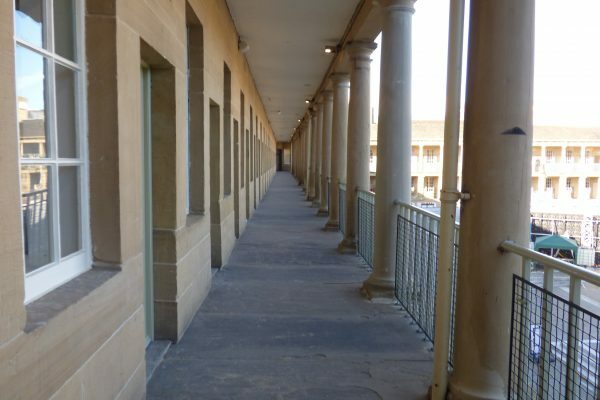 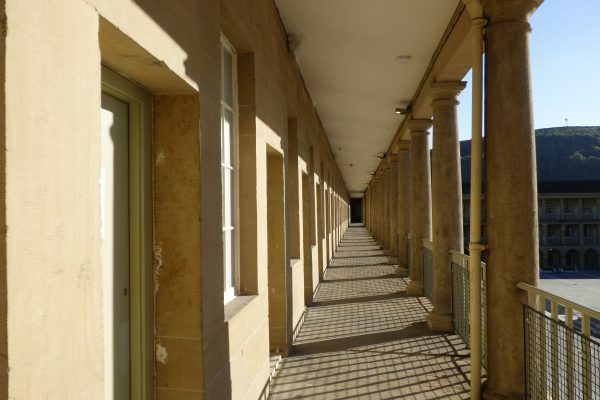 The merchants’ rooms are set back behind elegant colonnades. 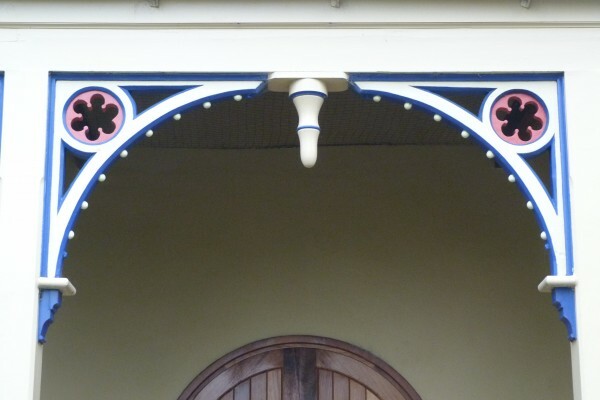 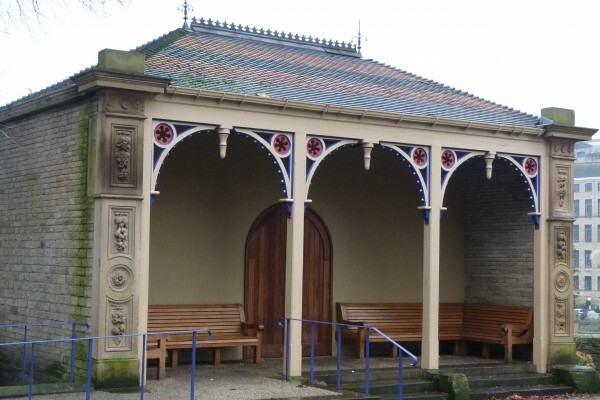 The lower arcade has round-headed arches on square piers. 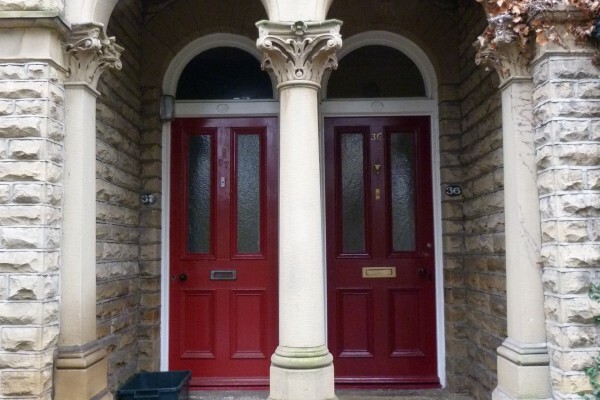 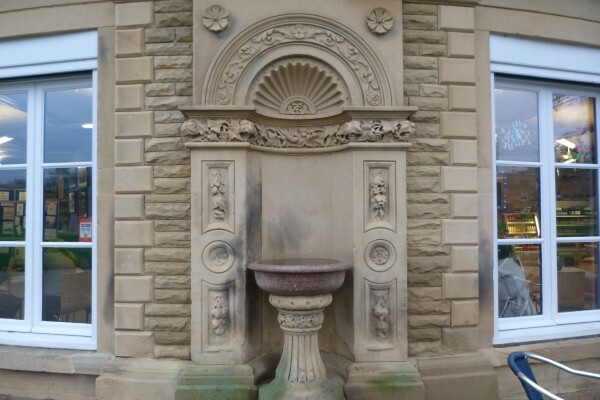 The middle level has Rustic pillars with Tuscan capitals. 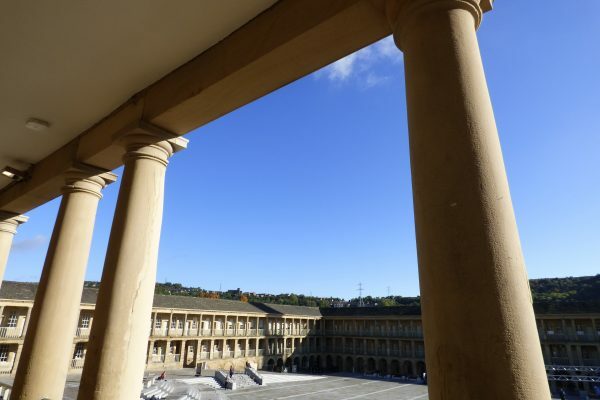 The upper colonnade has circular Doric columns. 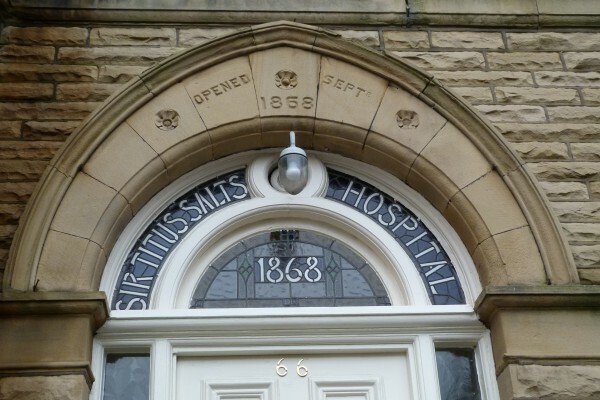 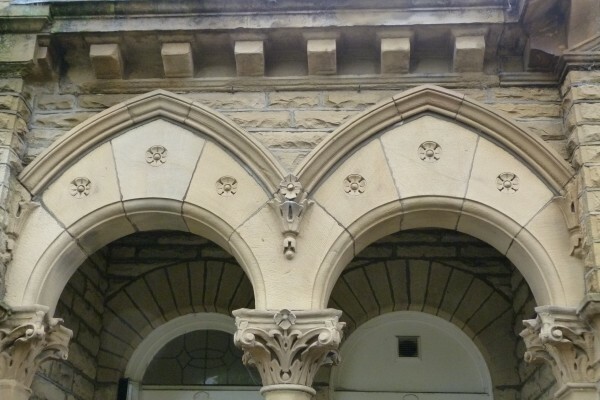 There are arched gateways on three sides of the building. 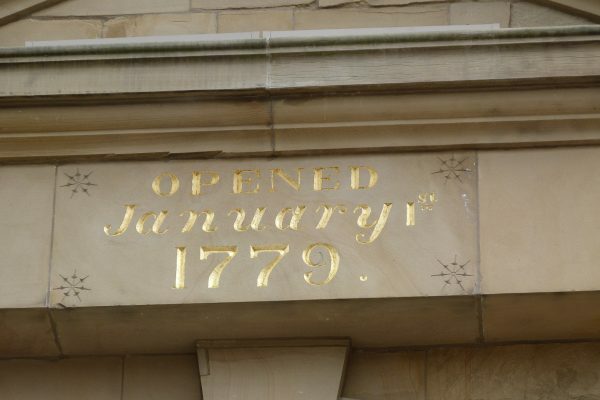 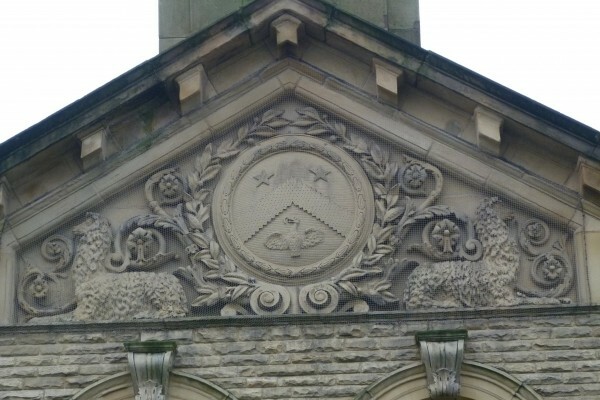 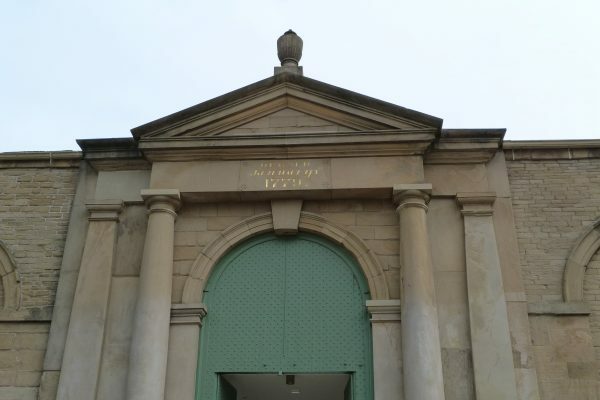 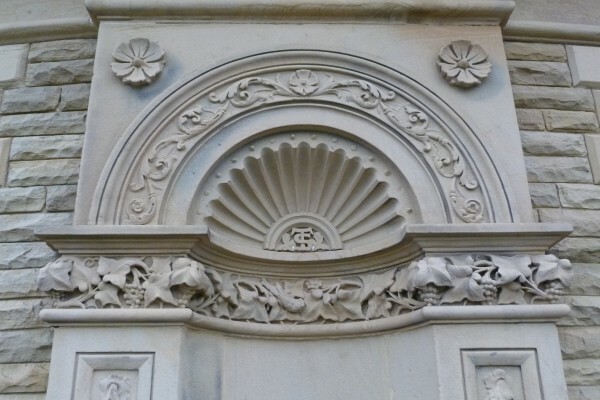 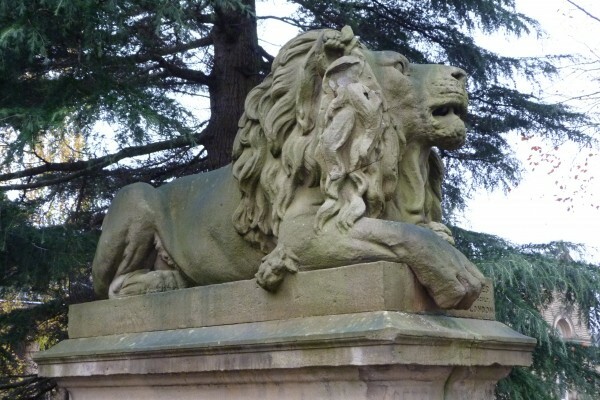 The north gateway, which was originally the main entrance, has a pediment topped by a classical urn, and is inscribed ‘Opened January 1st 1779’. 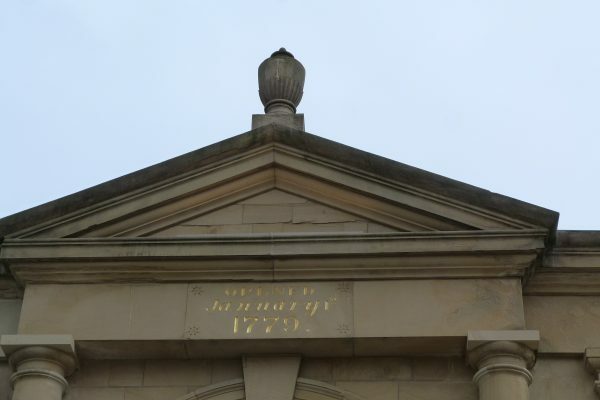 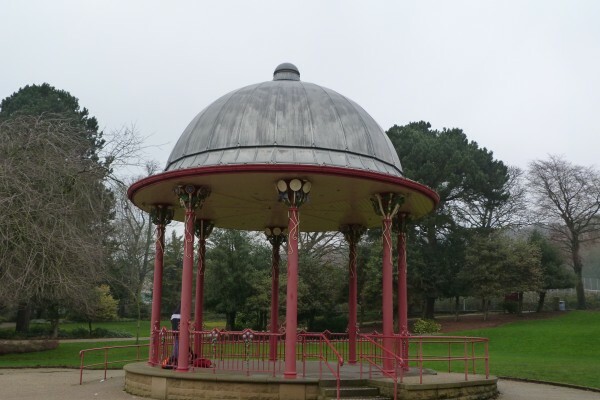 The west gateway has a classical cupola with a bell, surmounted by a Golden Fleece and a weather vane. 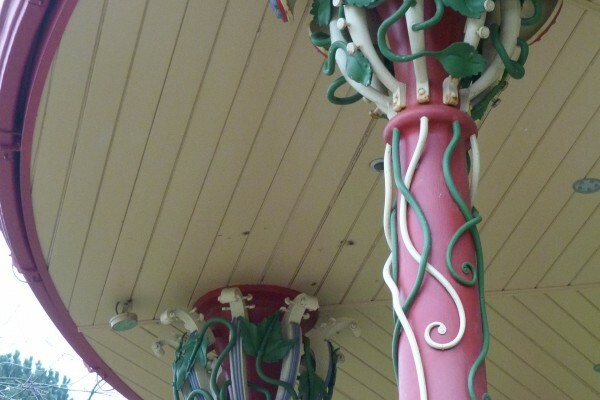 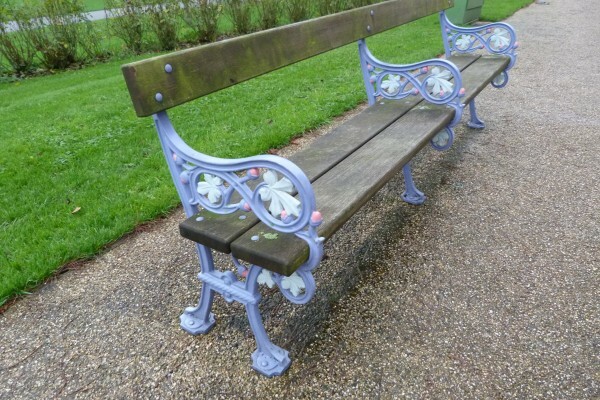 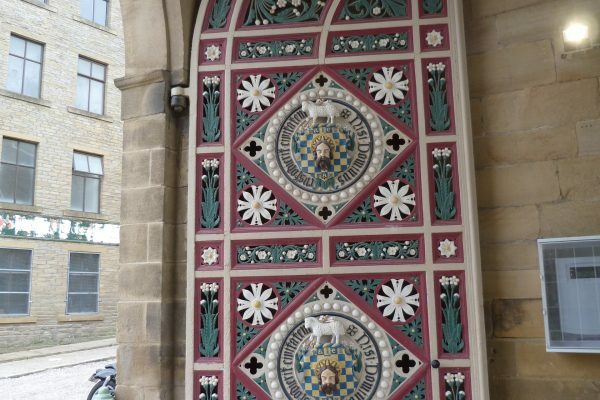 The south gateway features elaborate multi-coloured cast iron gates dating from 1871. 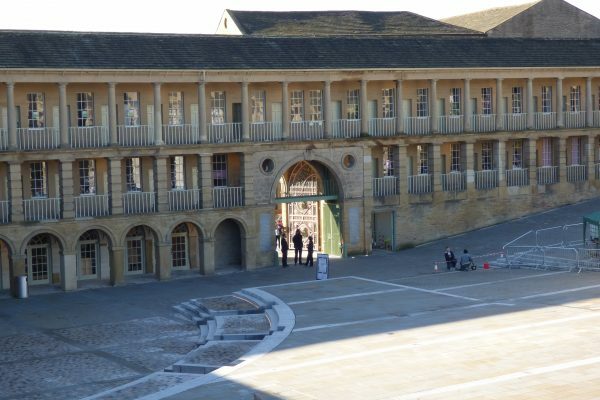 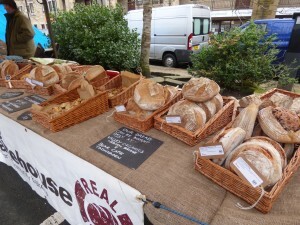 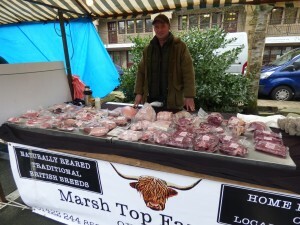 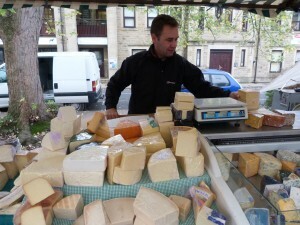 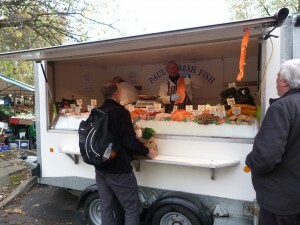 Trading at the Piece Hall was strictly regulated and took place between 10 am and 12 noon each saturday morning. 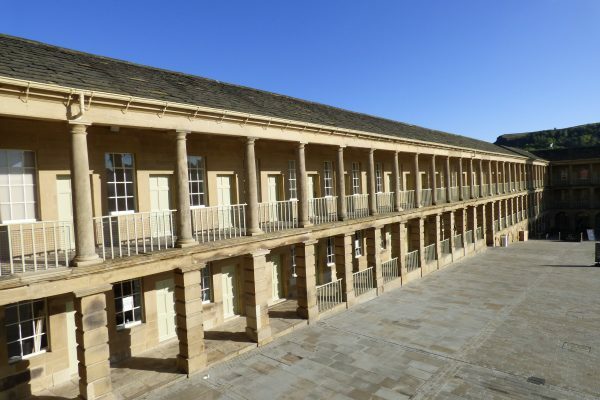 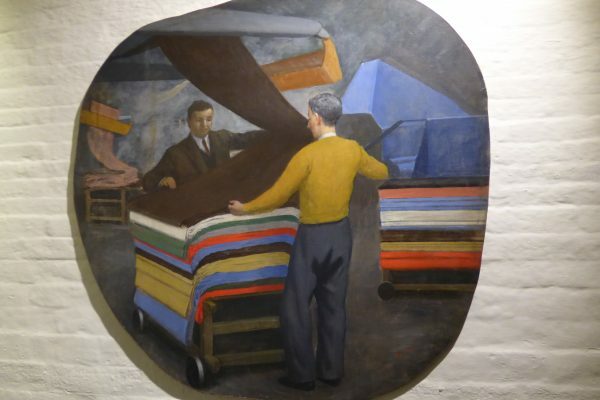 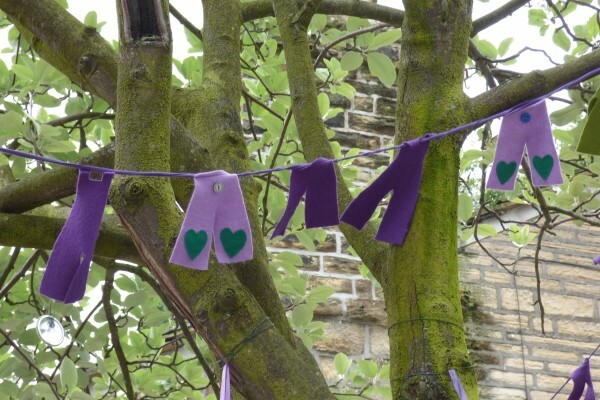 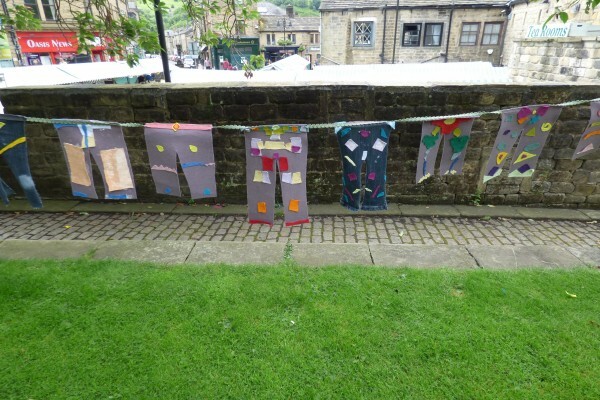 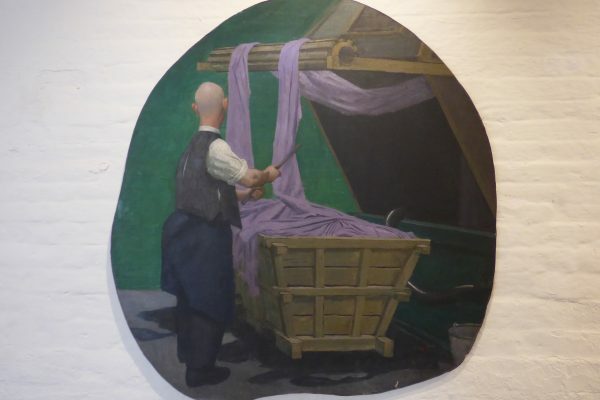 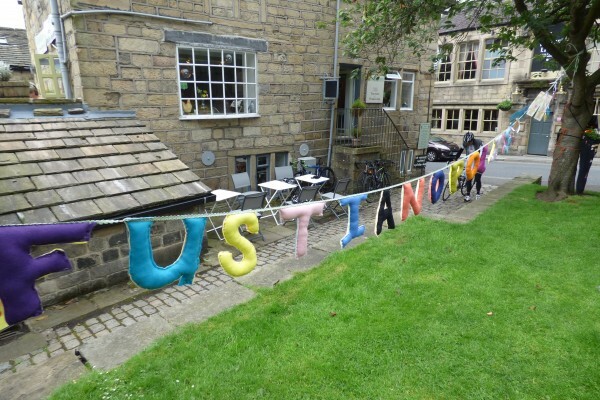 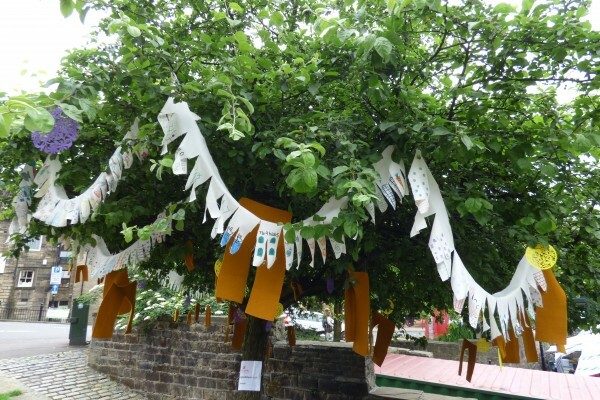 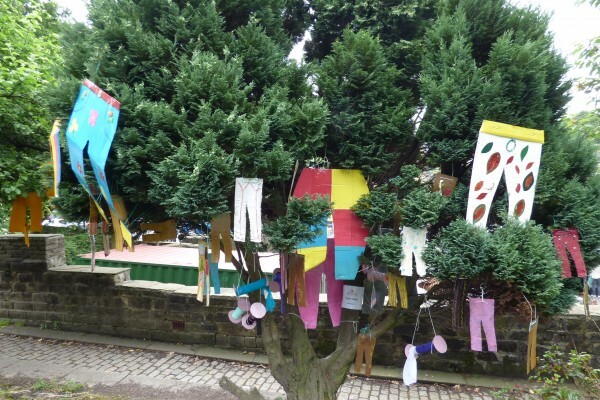 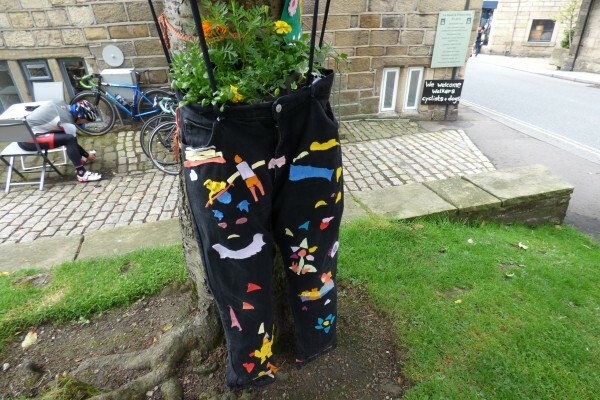 Originally cloth was transported to the Piece Hall by packhorses after being collected from farms and cottages on the surrounding uplands where it was made. 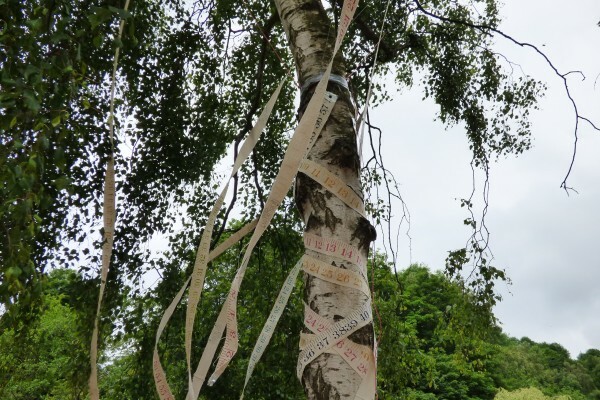 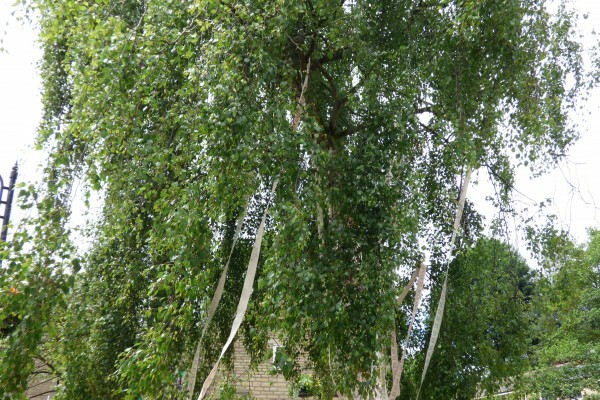 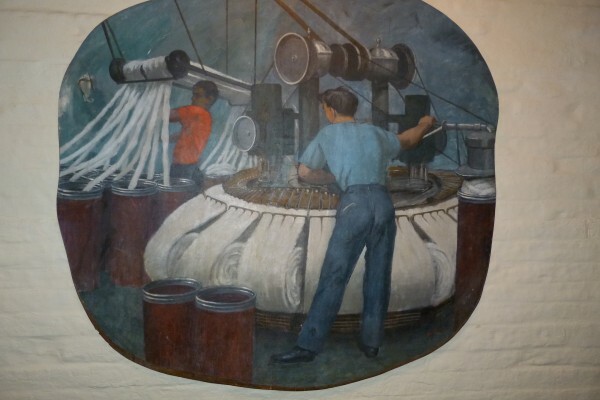 The cloth was then distributed throughout Britain and Europe. 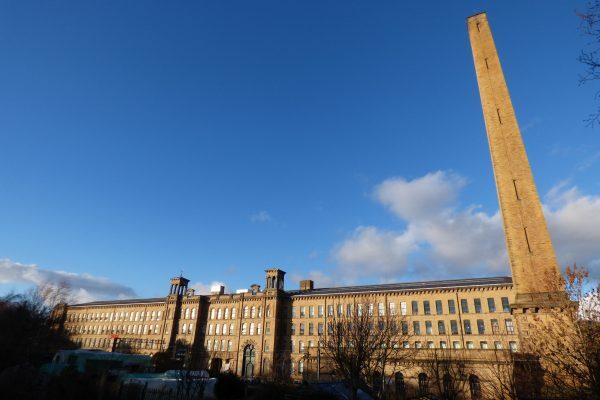 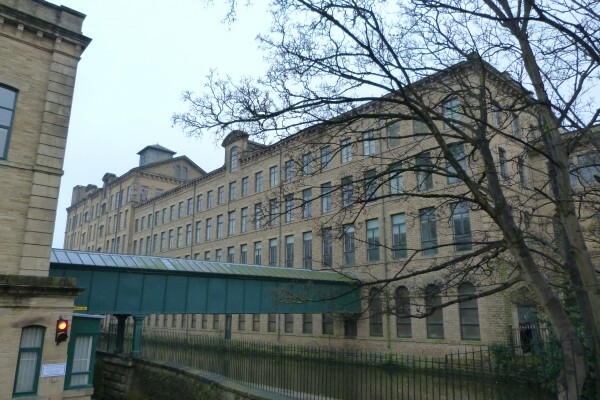 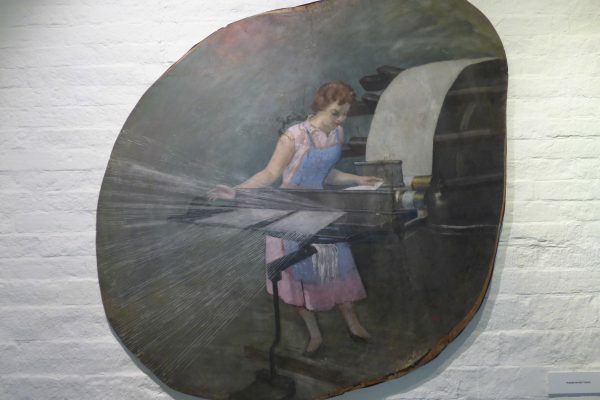 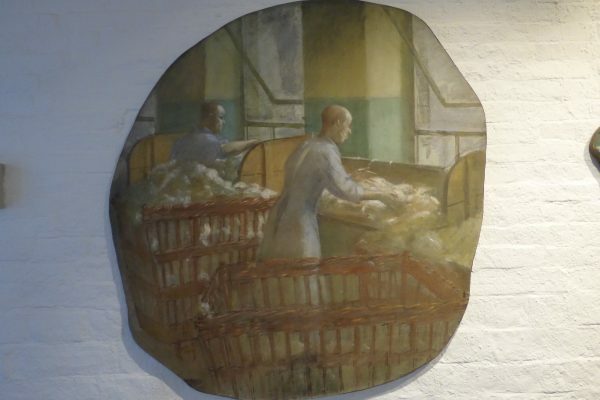 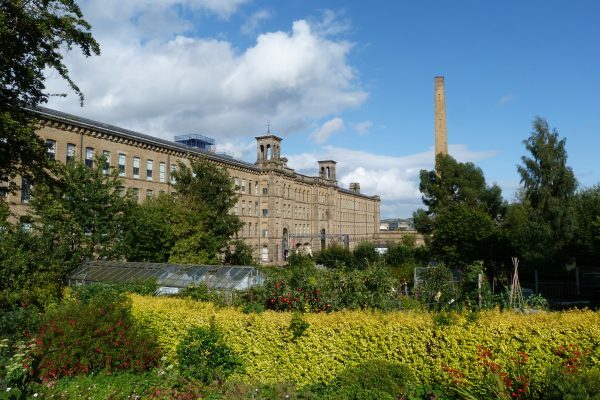 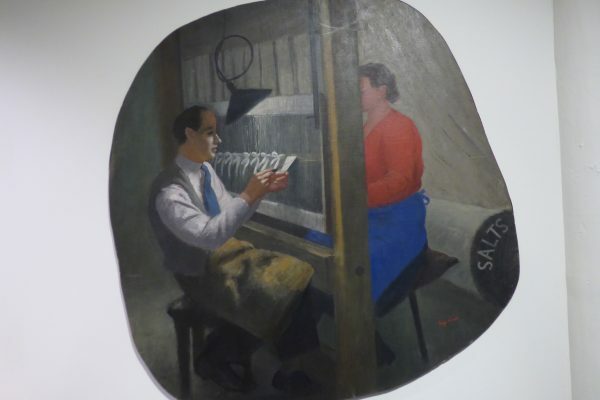 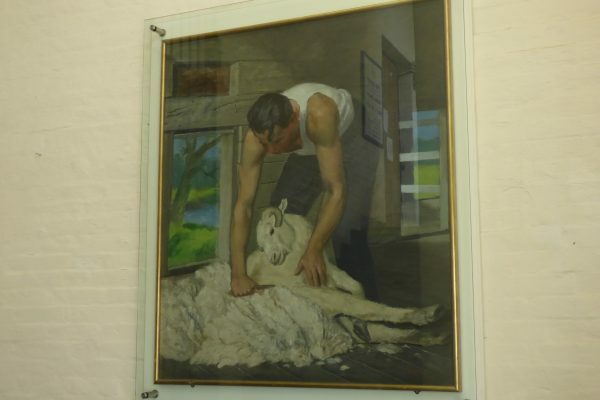 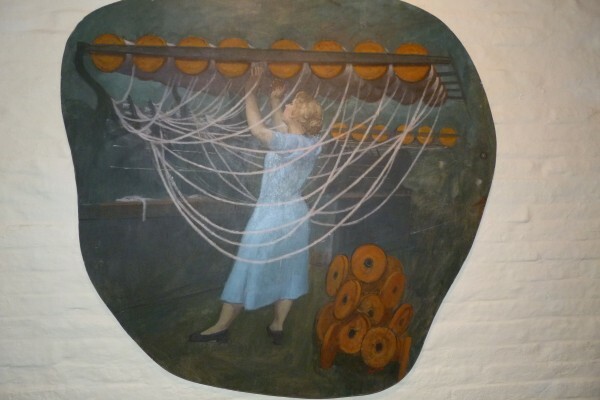 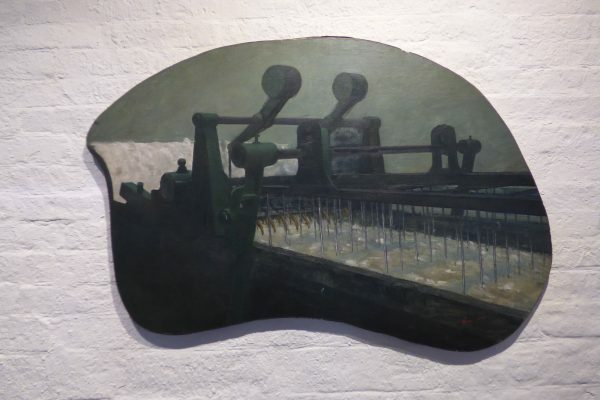 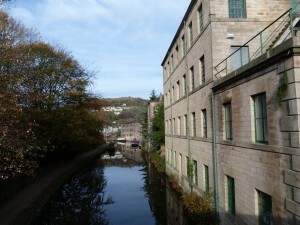 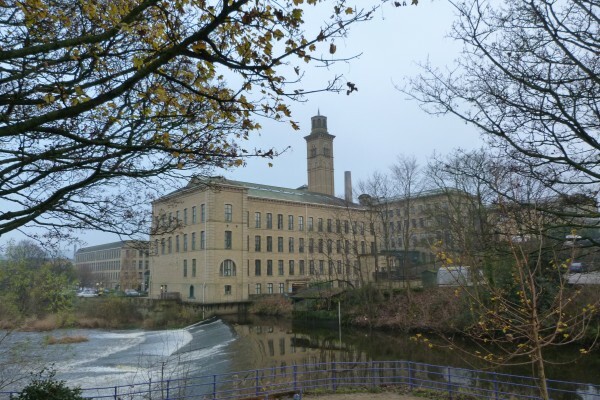 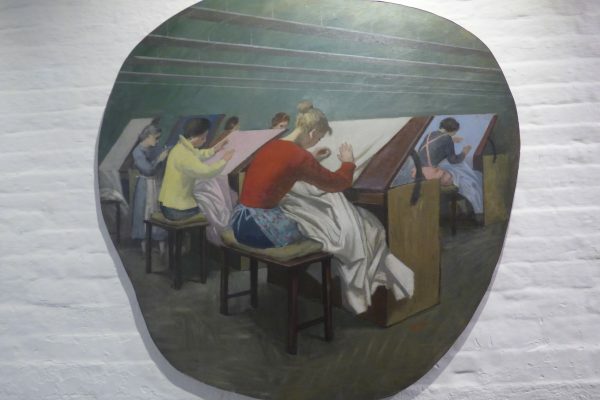 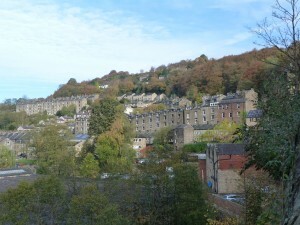 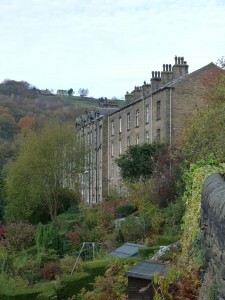 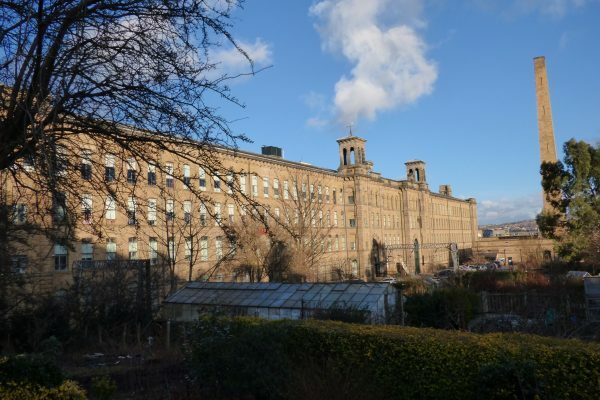 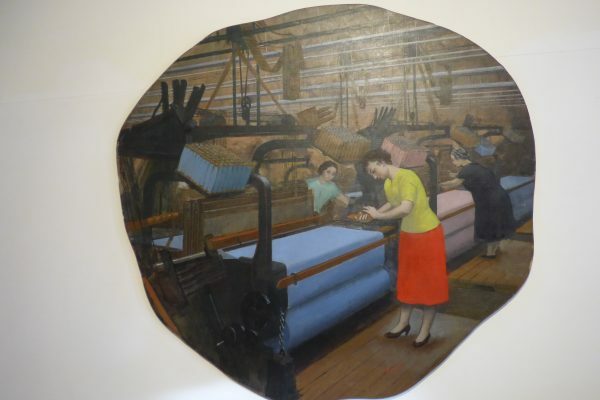 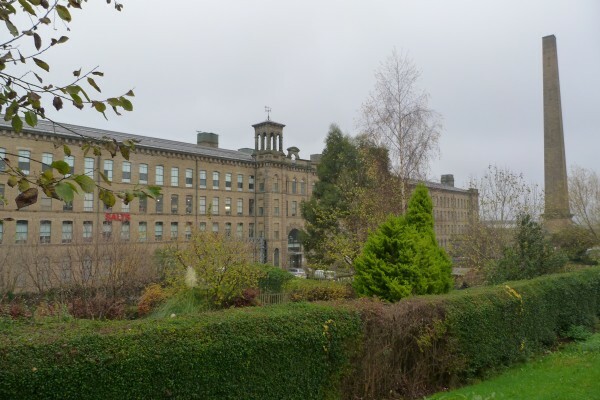 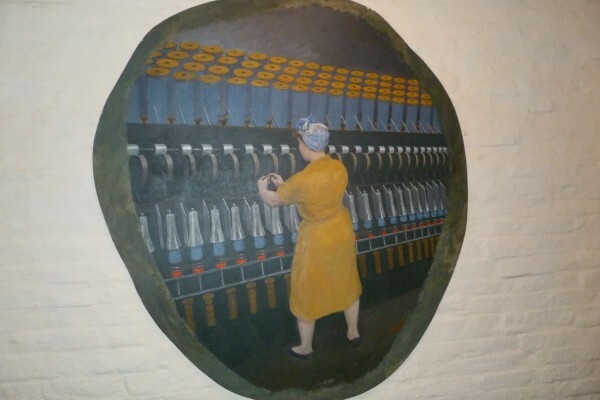 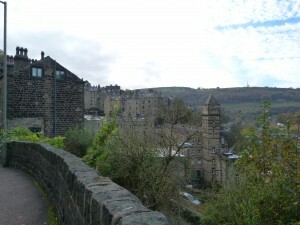 Following the Industrial Revolution, textile manufacturing processes were mechanised and production shifted to water- and steam-powered mills in the valleys. 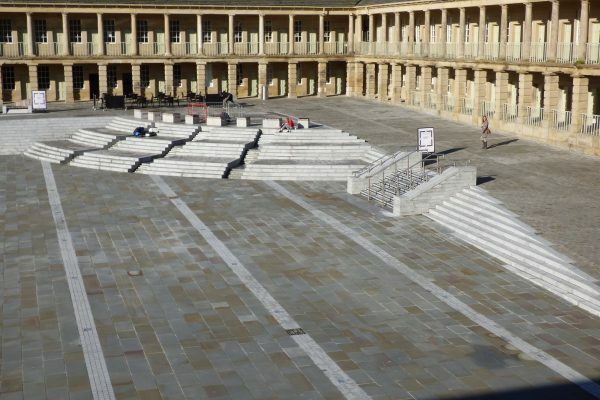 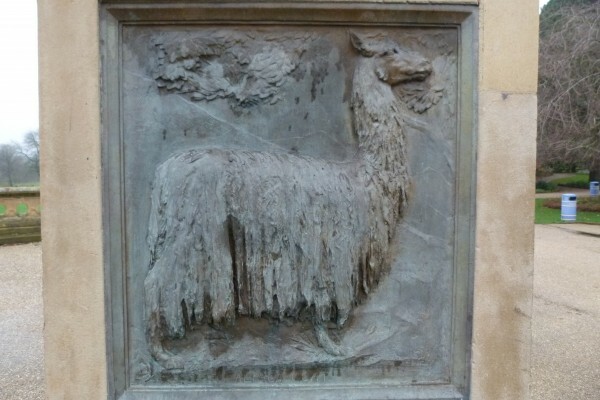 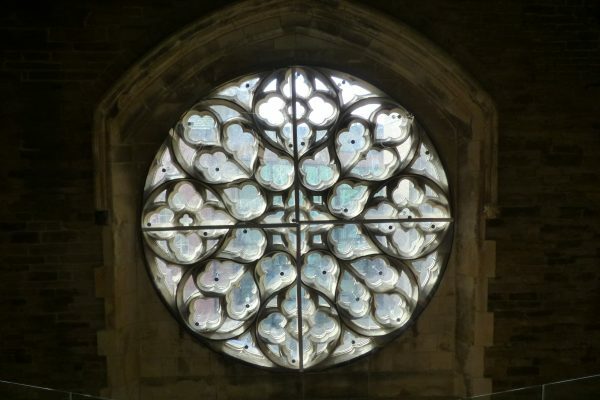 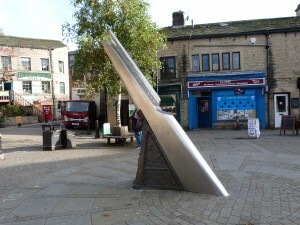 This radically altered the system of trade, as a result of which the Piece Hall rapidly became defunct. 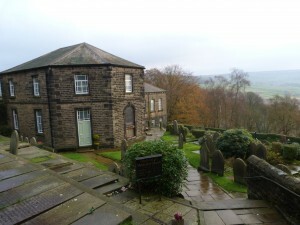 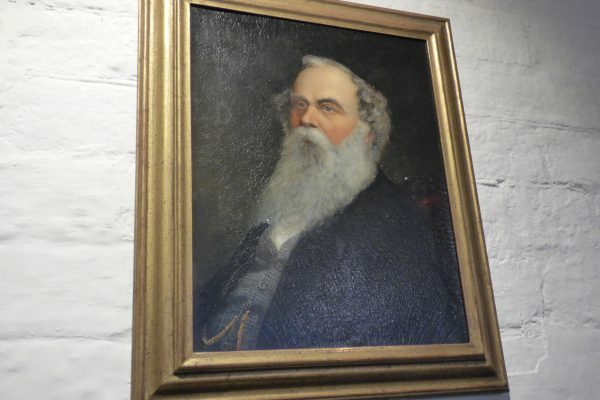 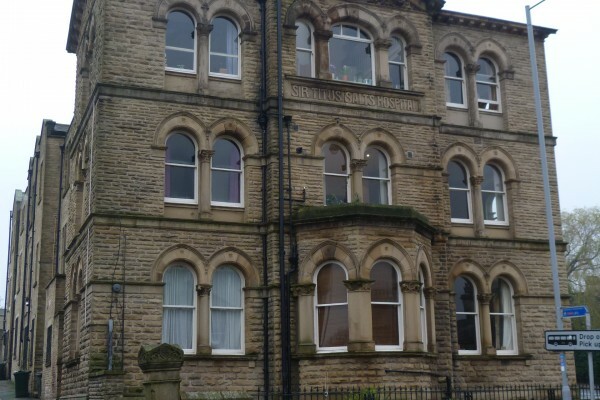 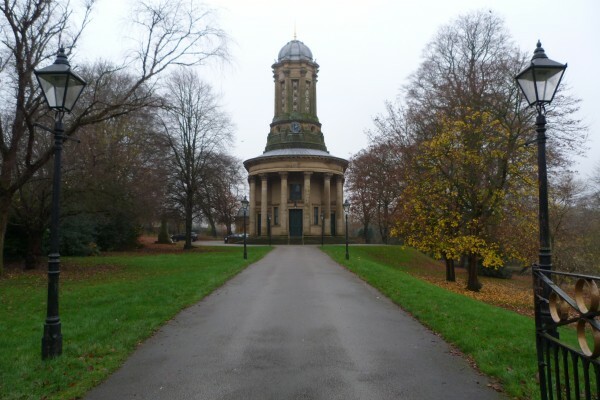 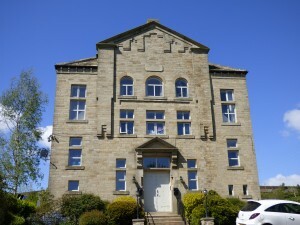 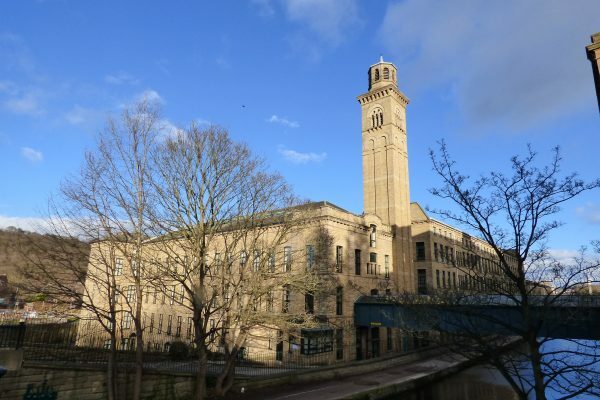 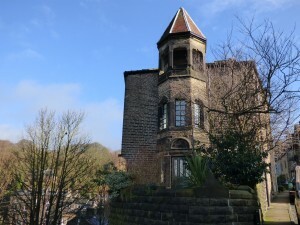 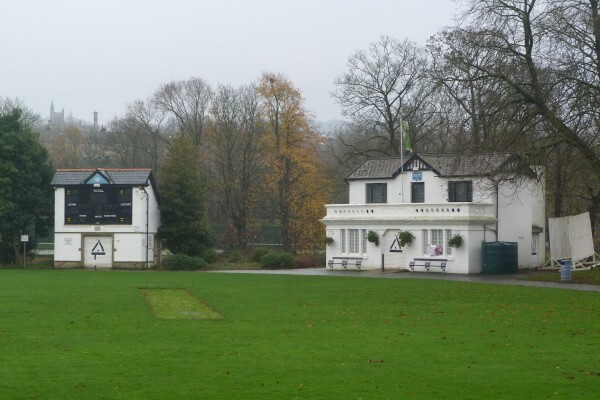 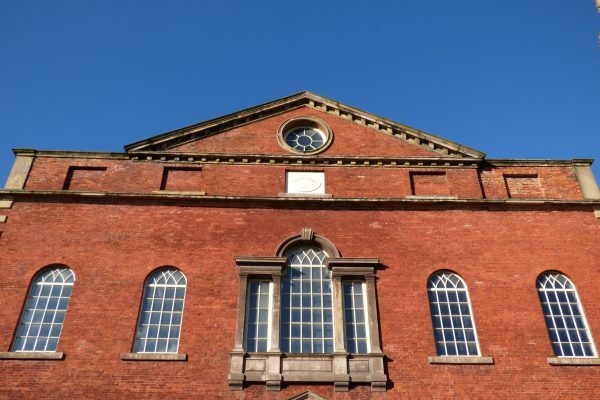 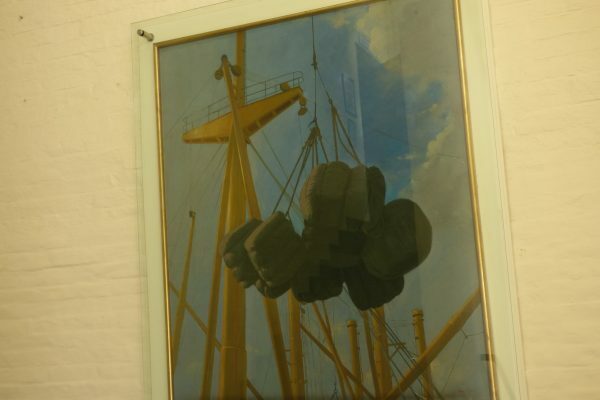 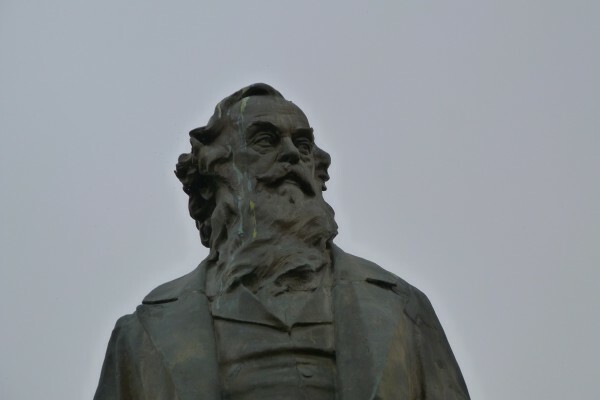 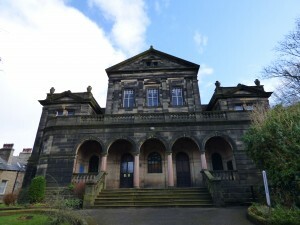 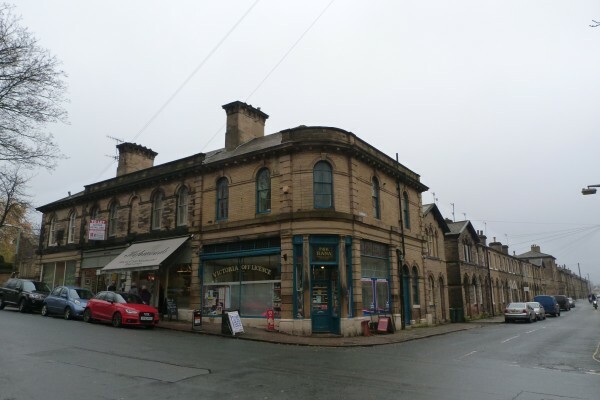 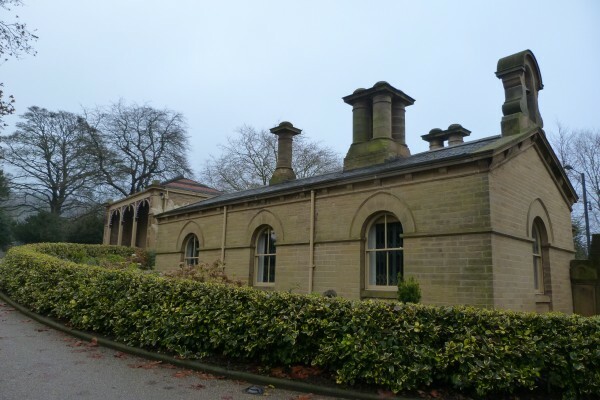 From the early 19th century onwards the building was used for a variety of additional purposes, including firework displays, religious sermons and political rallies. 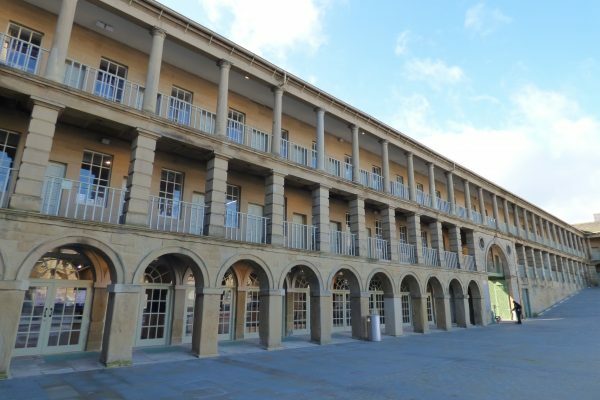 In 1867 the Piece Hall was transferred to the Halifax Corporation and from 1871 onwards it was used as a wholesale fish, fruit and market. 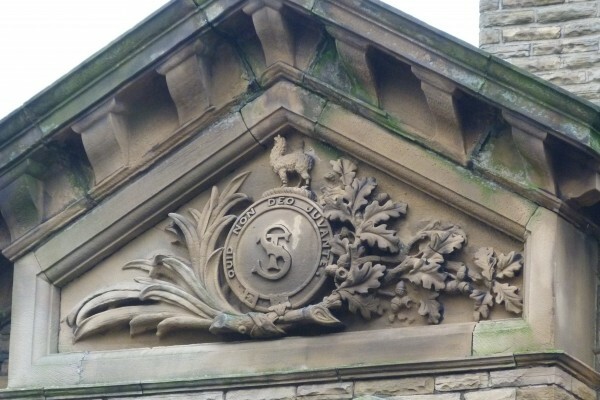 This continued for the next 100 years. 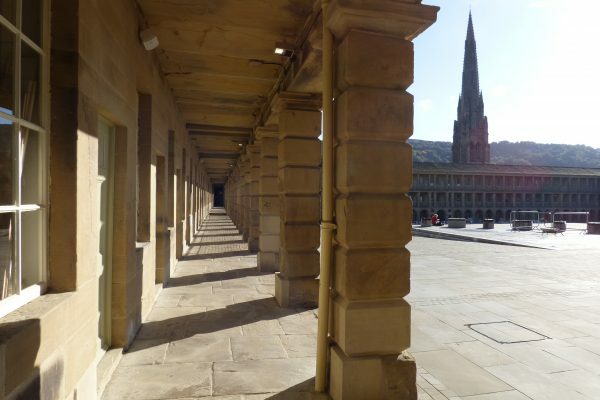 By the early 1970s when the wholesale market ceased, the Piece Hall had fallen into disrepair and was threatened with demolition. 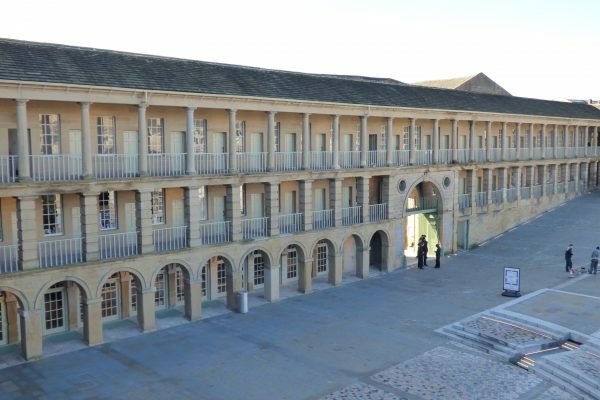 Thankfully it was saved, however, and after being renovated, the building reopened in 1976 housing shops and an outdoor market. 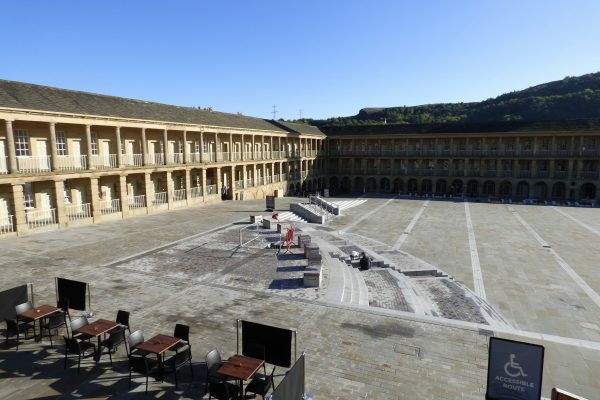 Following another major restoration project grant-aided by the Heritage Lottery Fund, the Piece Hall was given a new lease of life in 2017. 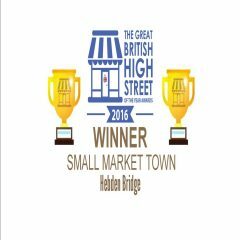 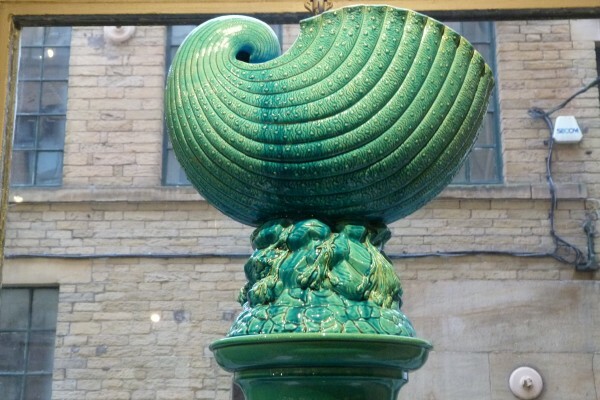 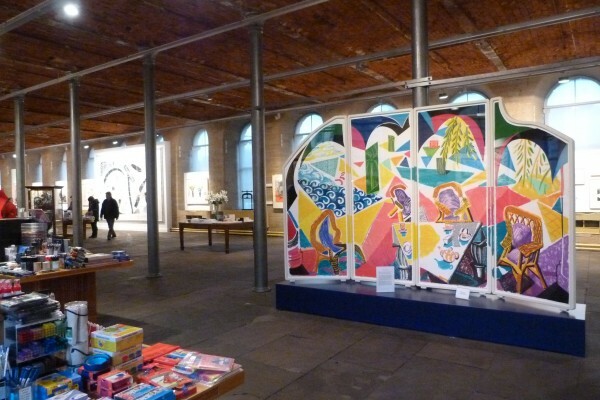 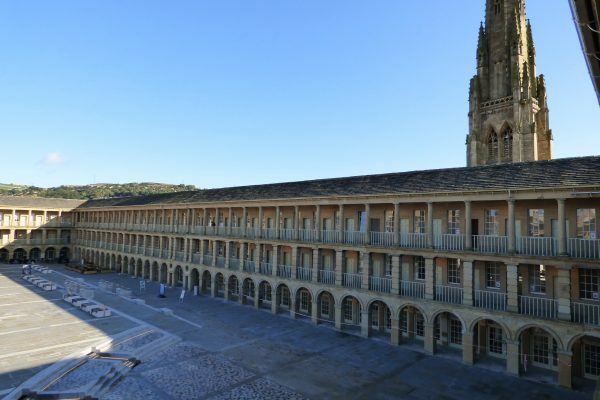 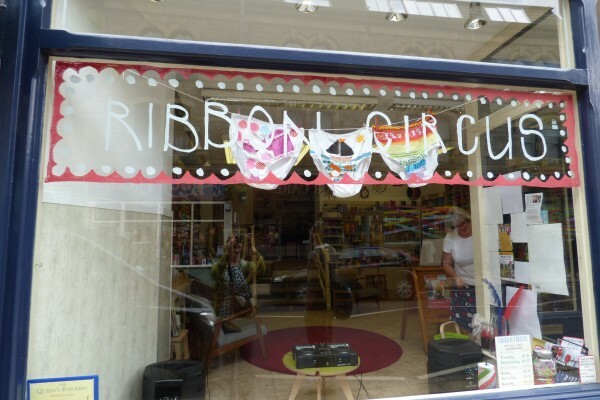 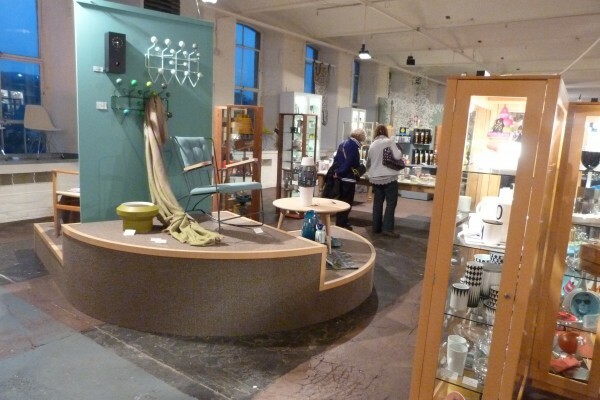 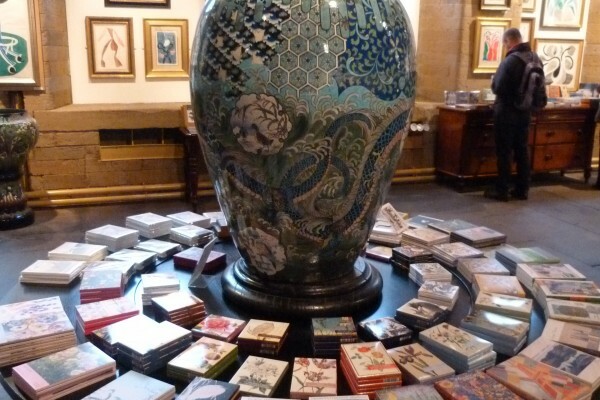 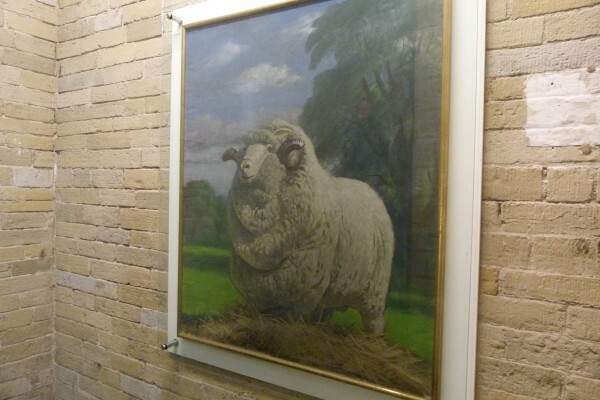 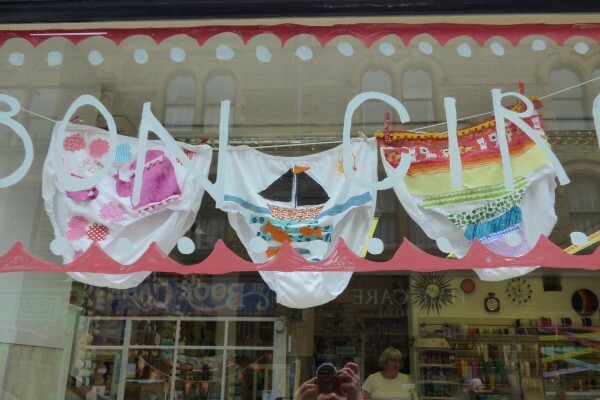 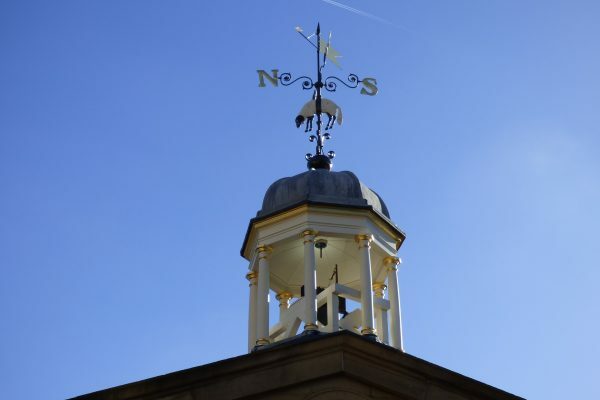 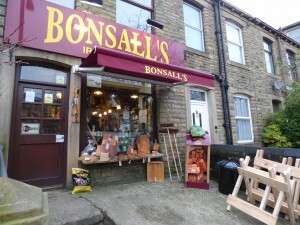 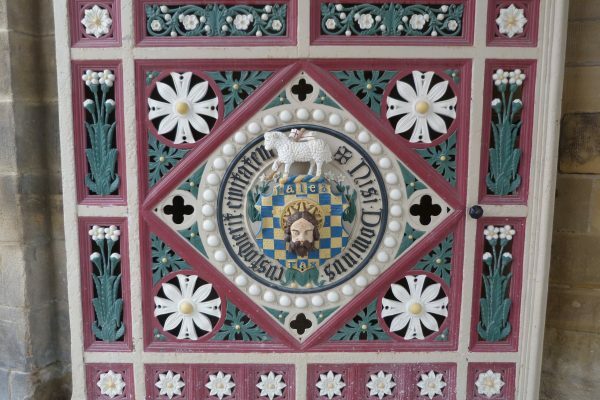 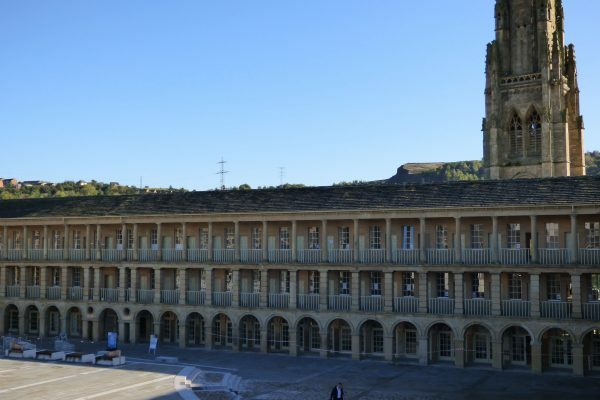 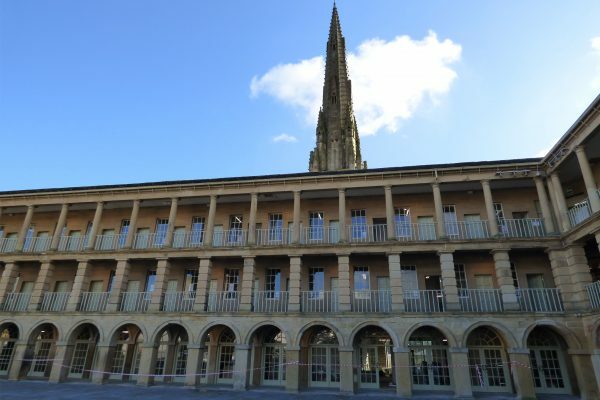 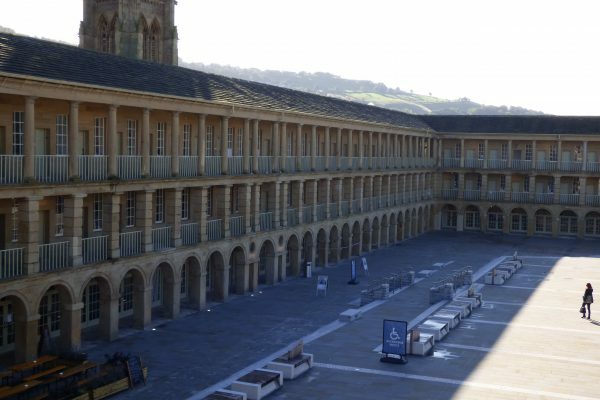 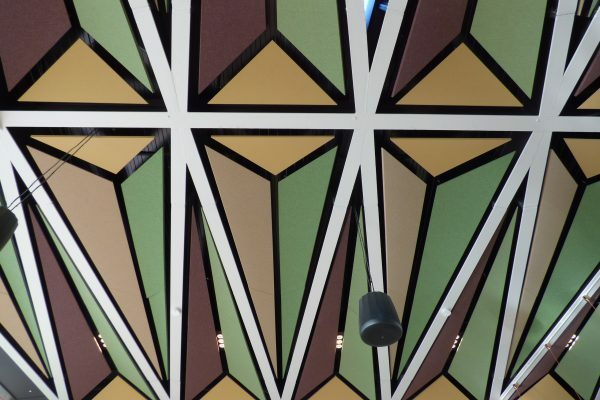 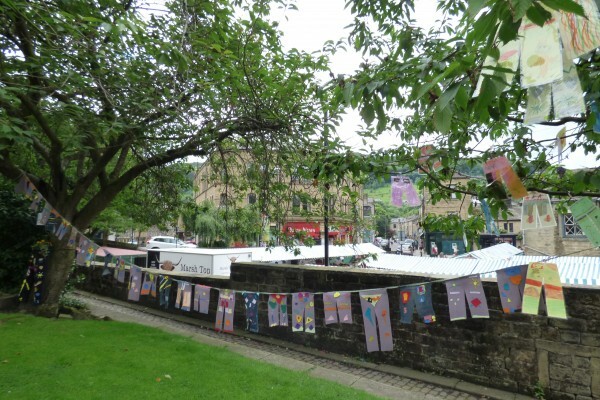 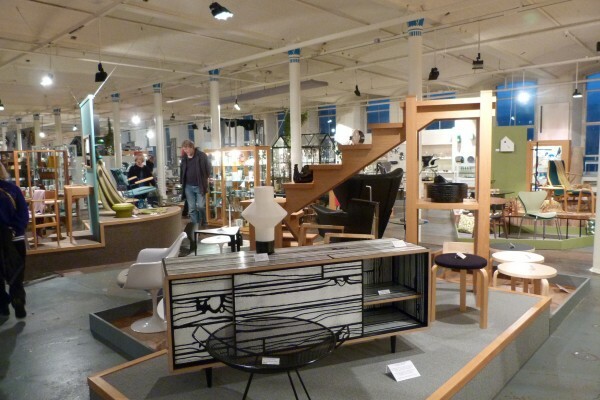 Now managed by the Piece Hall Trust, it incorporates shops, galleries, cafes and bars, as well as displays about the history of this iconic building. 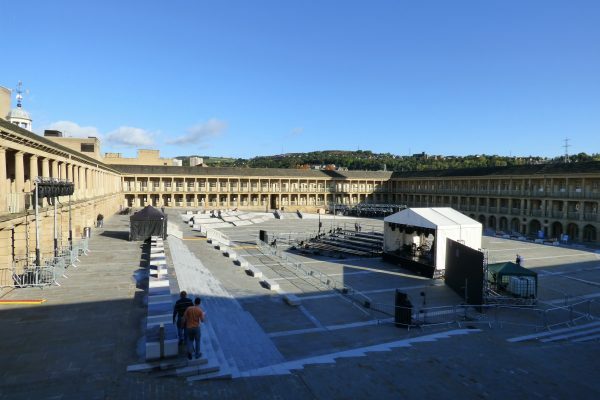 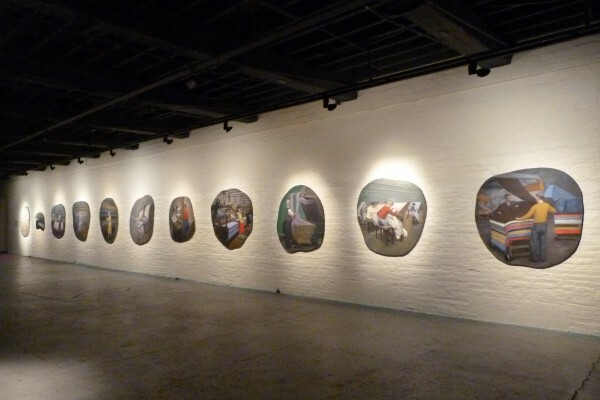 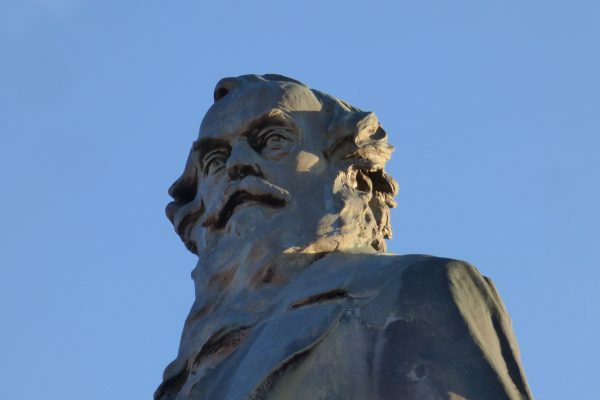 A varied programme of outdoor events – from street theatre to art installations and concerts – is held in the repaved central square, a stunning public space. 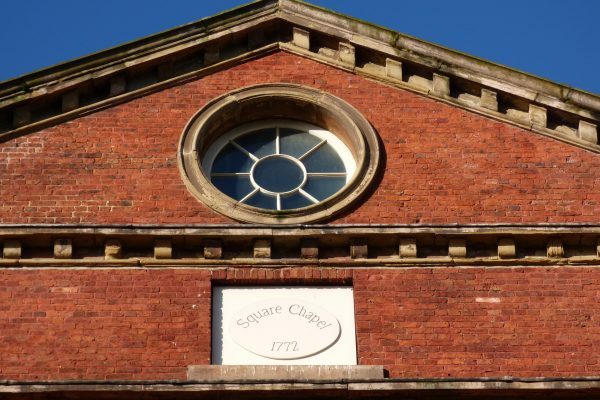 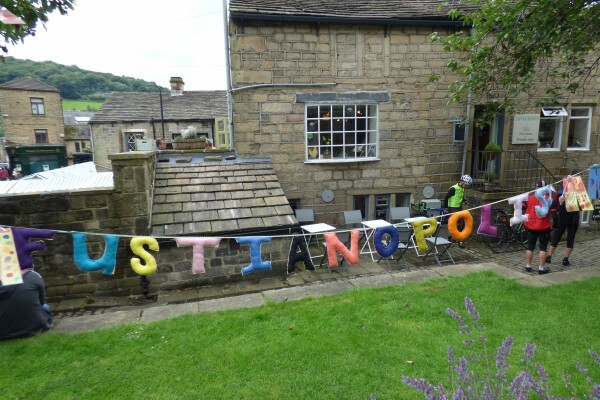 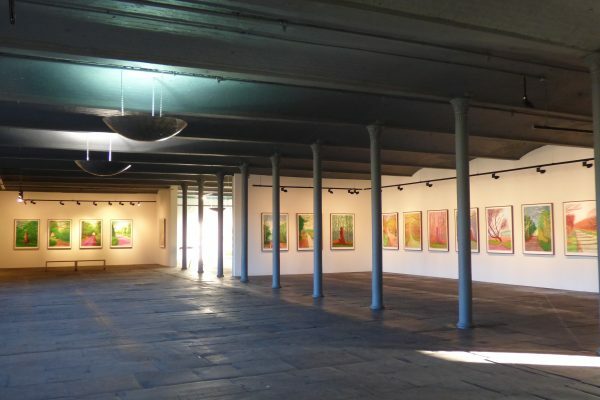 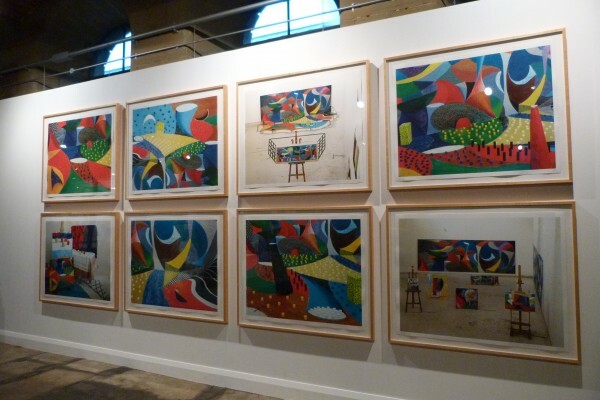 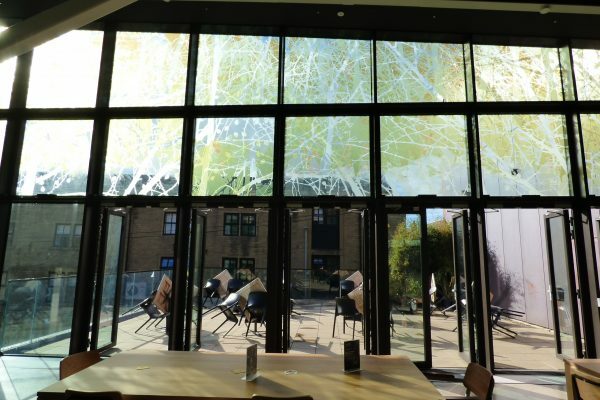 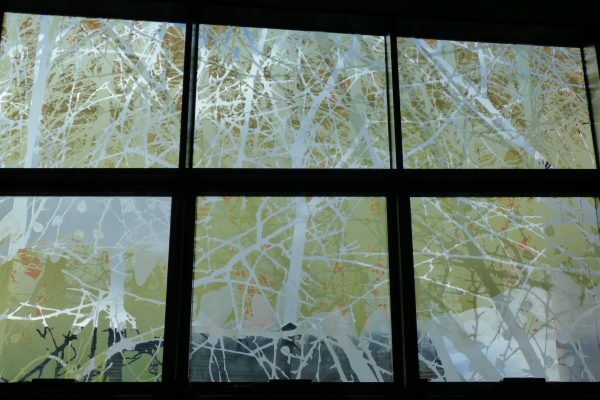 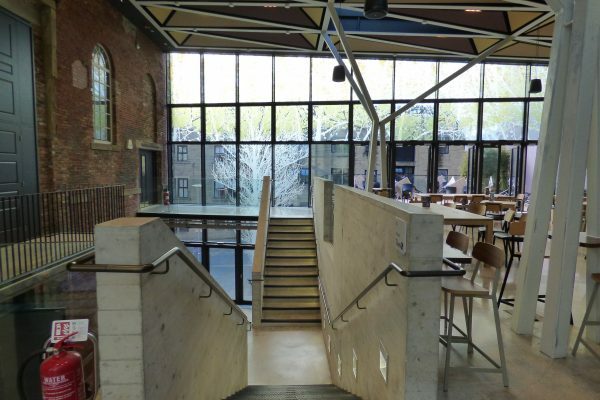 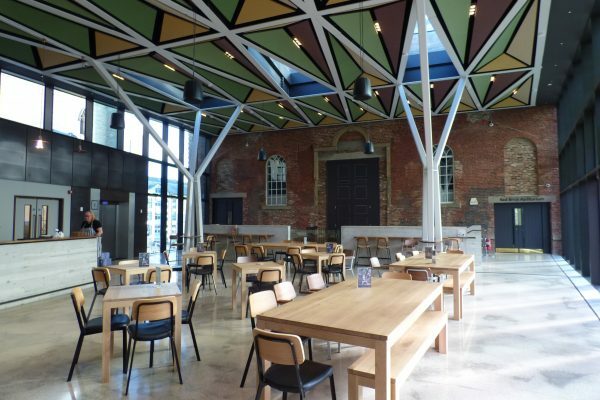 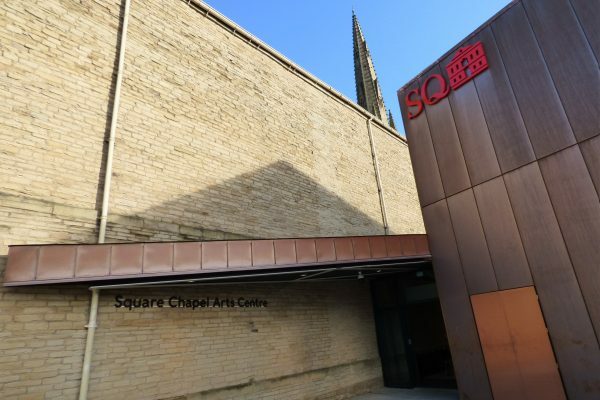 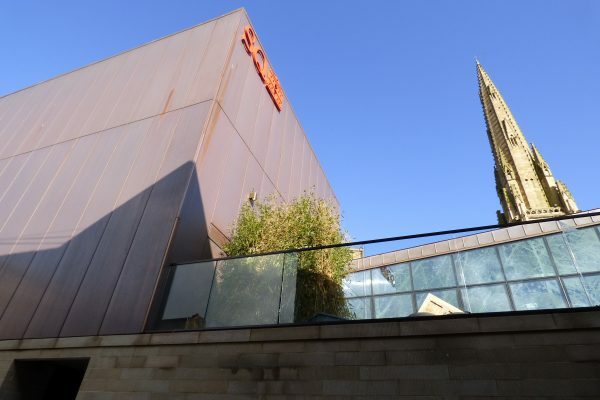 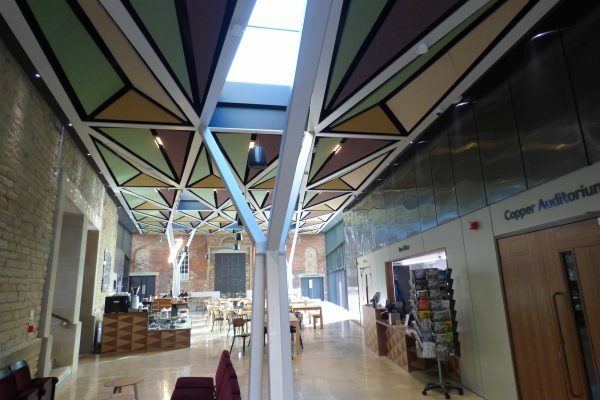 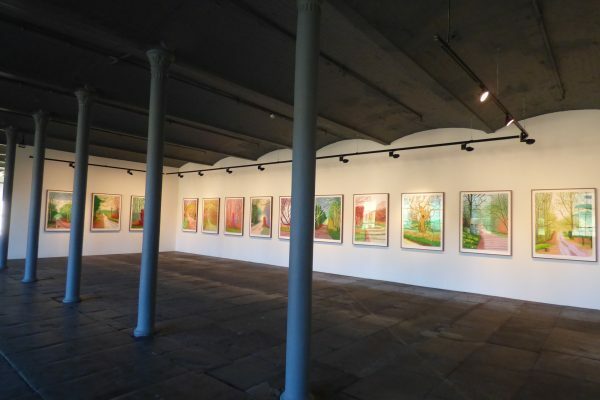 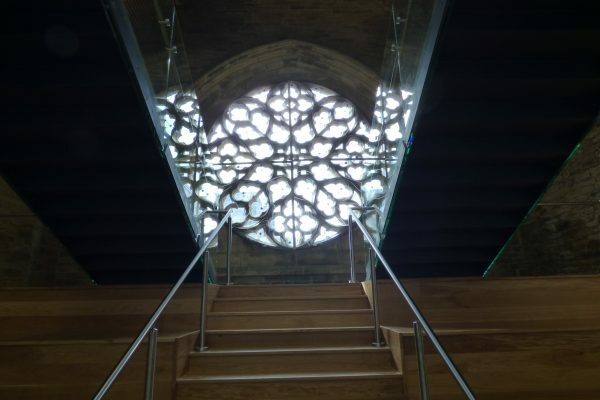 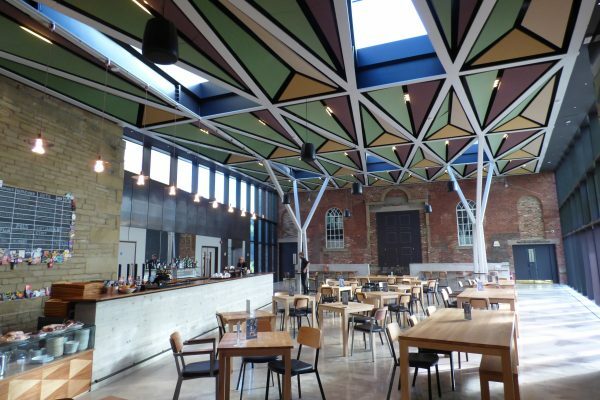 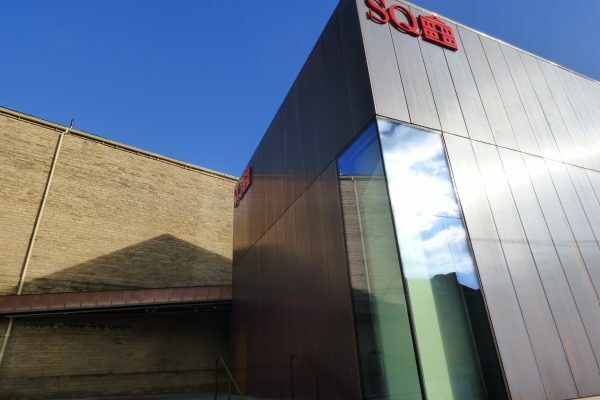 Adjoining the Piece Hall is the newly-extended Square Chapel Arts Centre, a lively arts complex including a cinema, theatre and cafe bar. 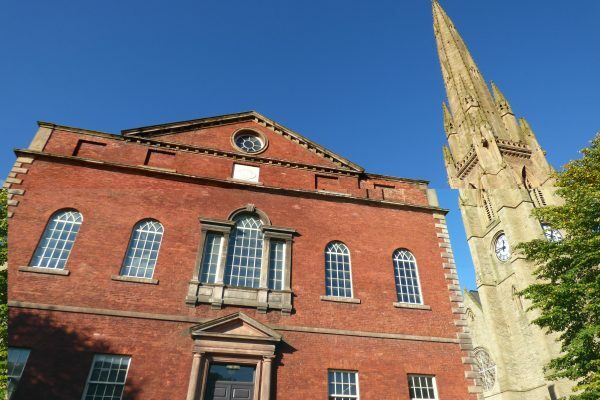 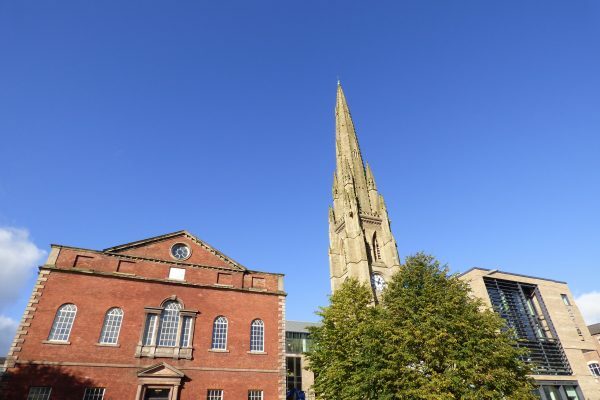 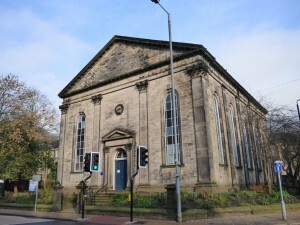 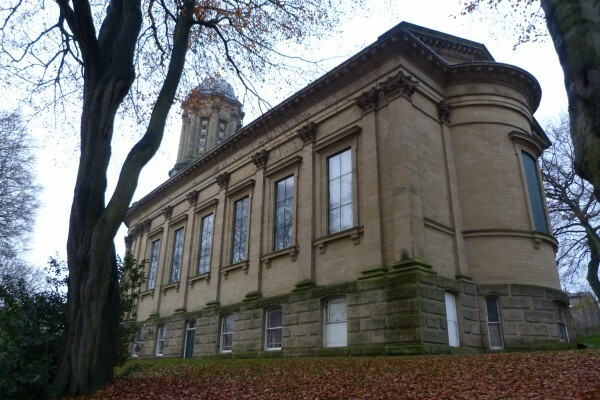 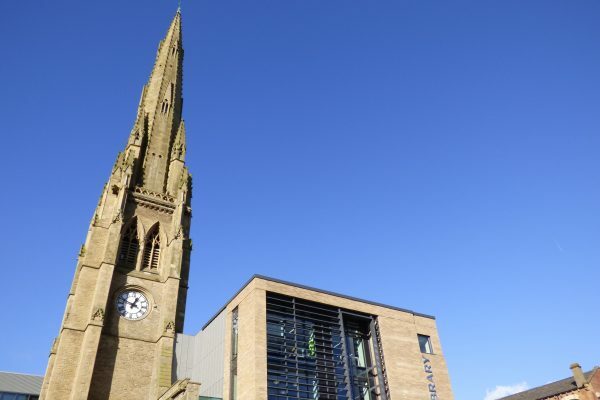 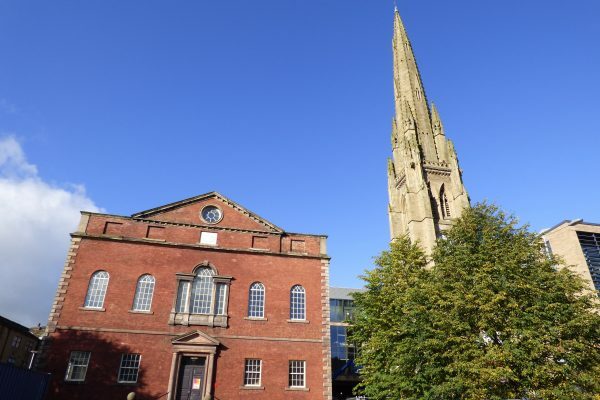 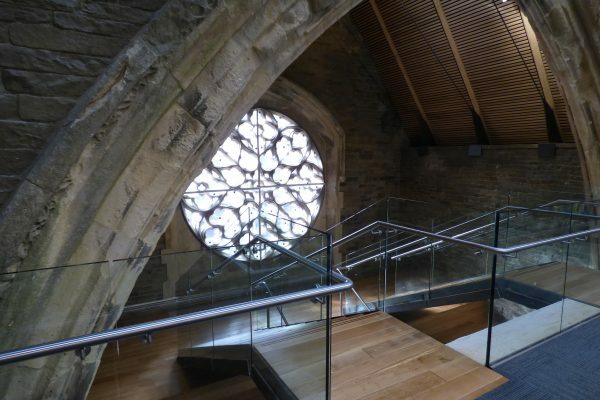 Housed in the historic Square Chapel, a red-brick Georgian chapel dating back to 1772, this is a key element in Halifax’s new Cultural Quarter, along with the new Central Library and Archive incorporating the spire of the 19th century Square Church. 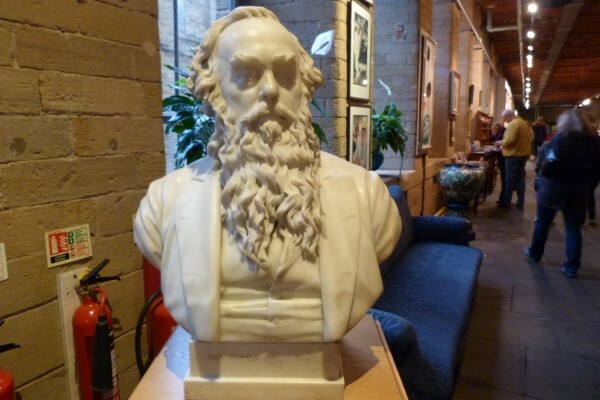 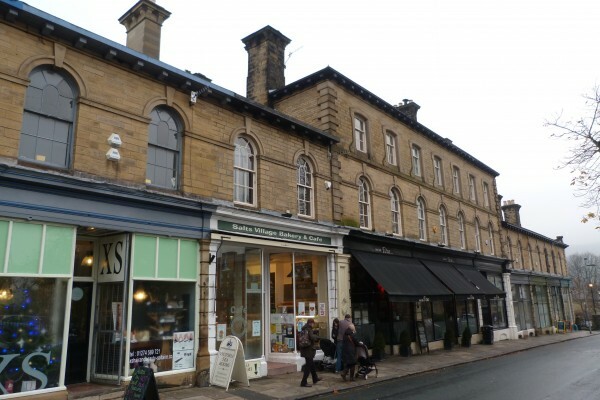 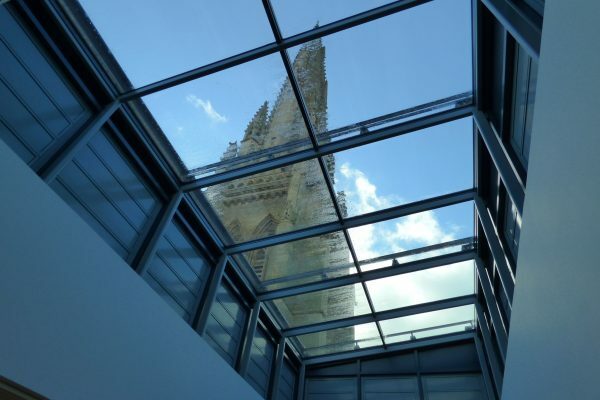 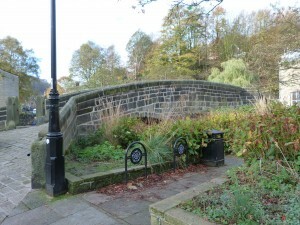 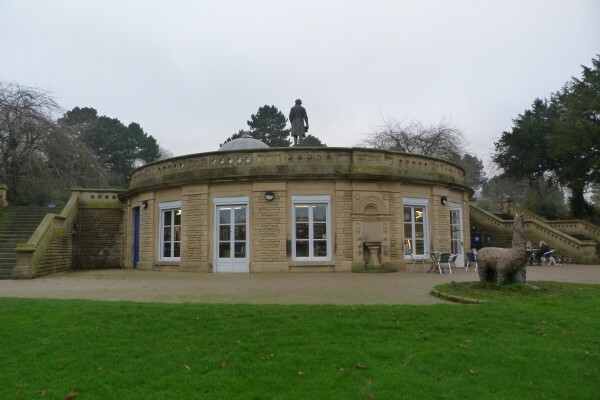 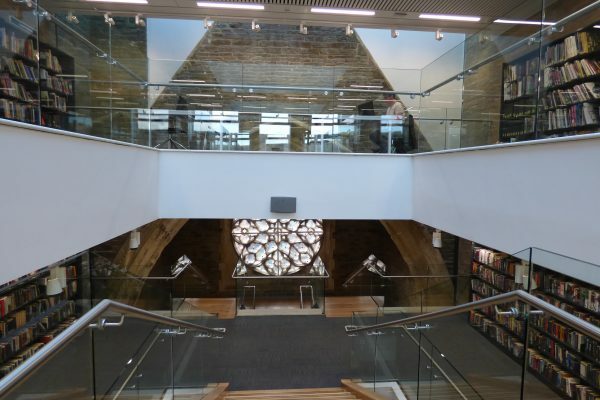 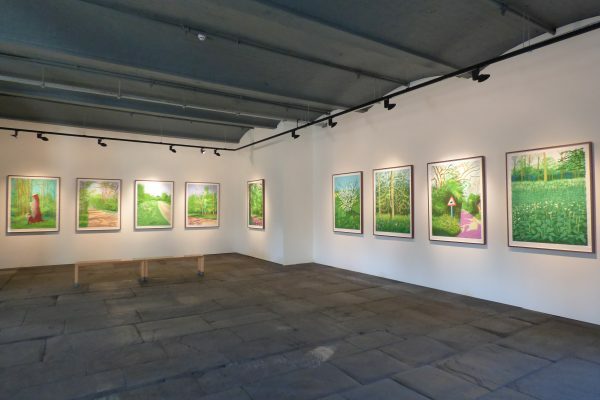 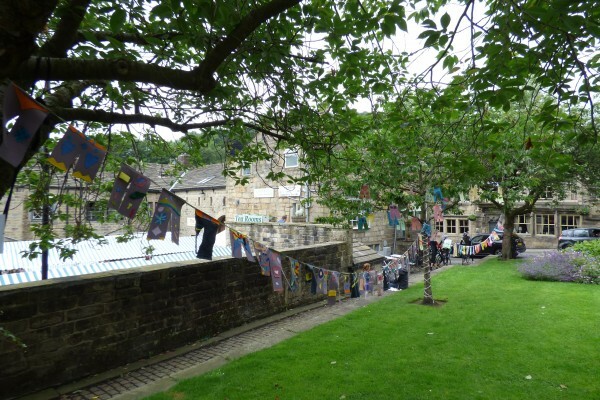 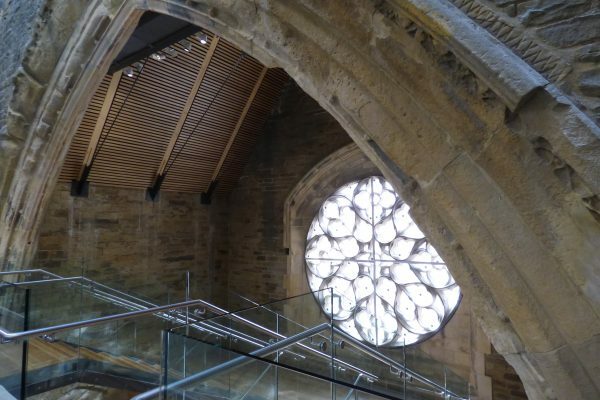 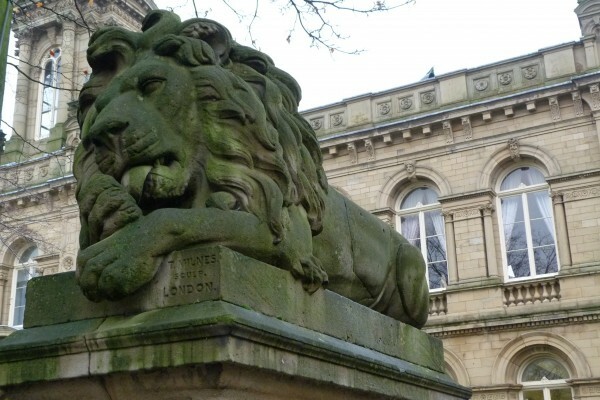 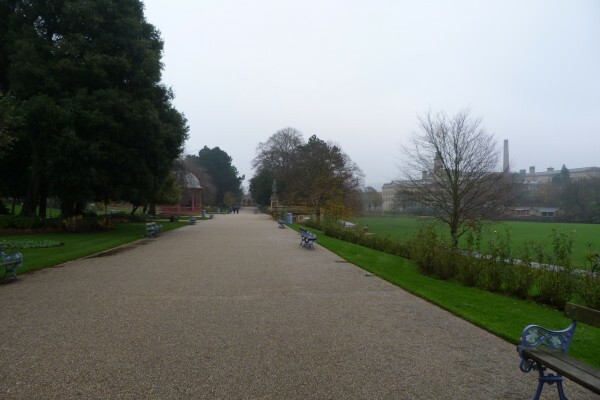 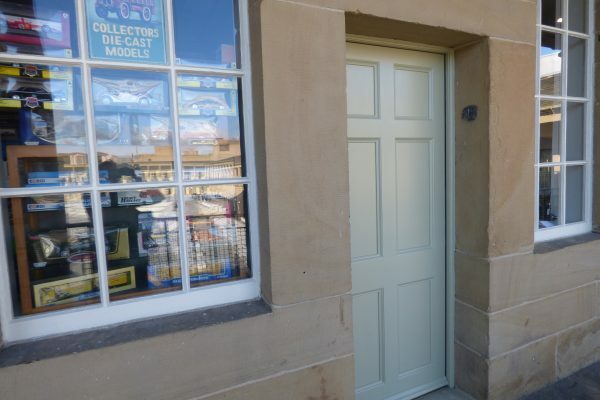 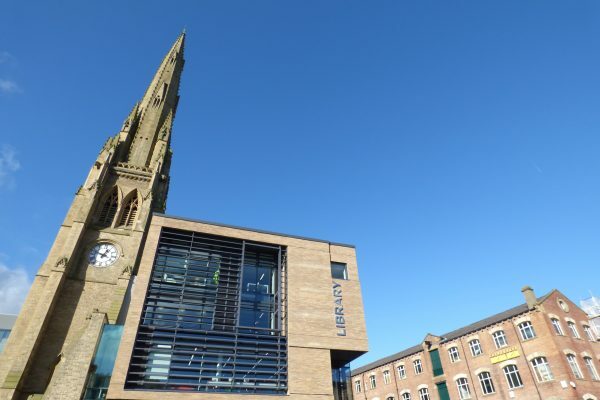 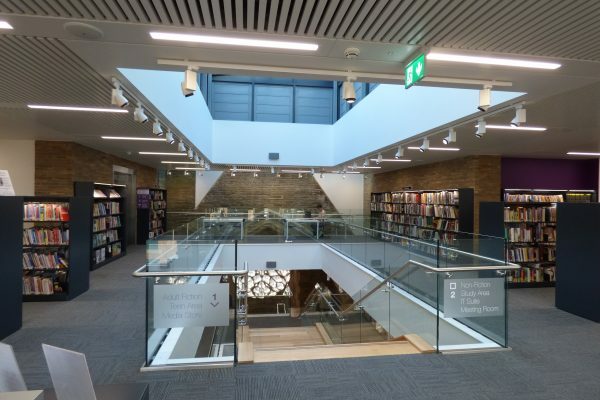 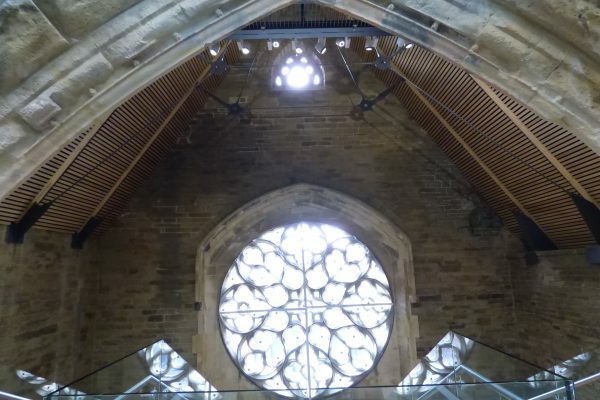 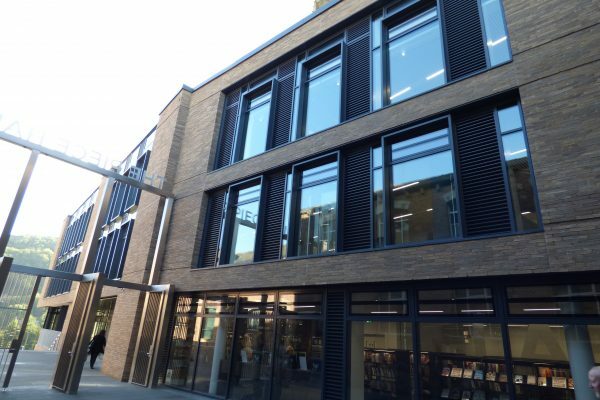 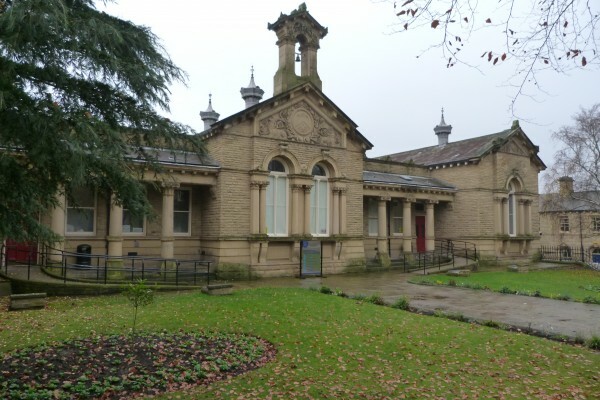 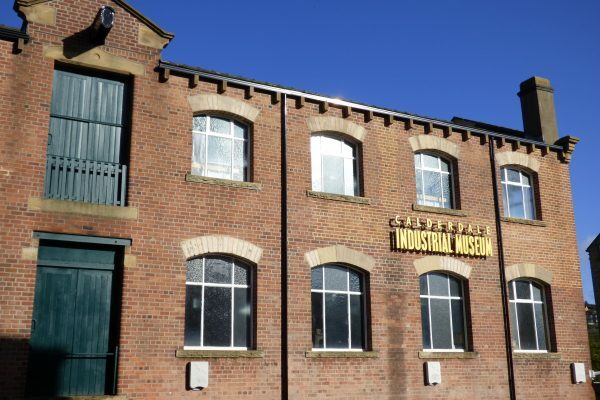 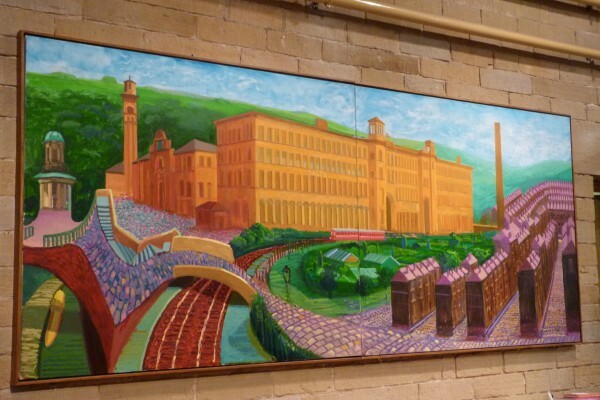 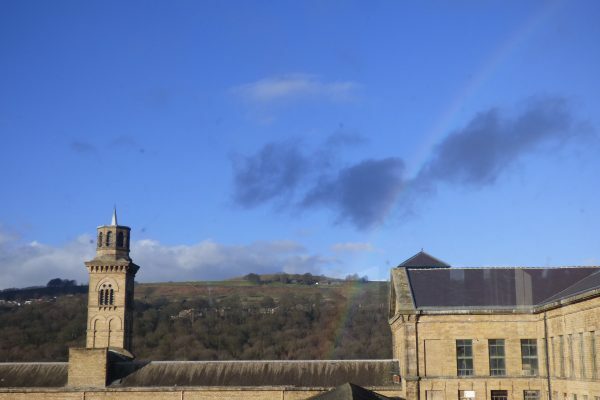 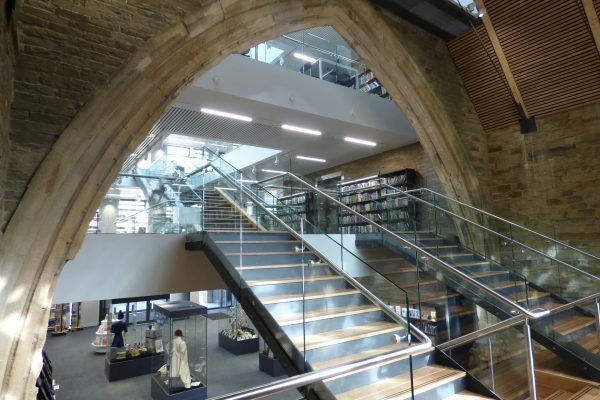 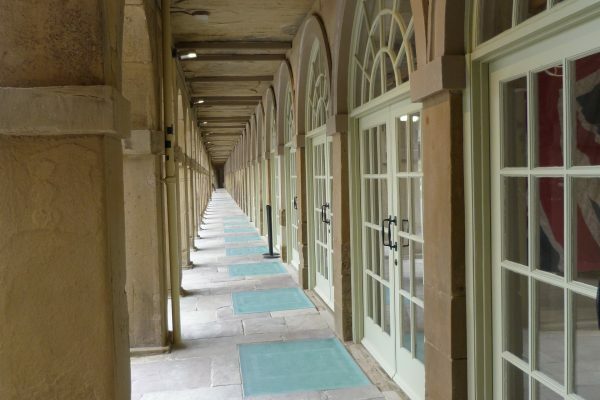 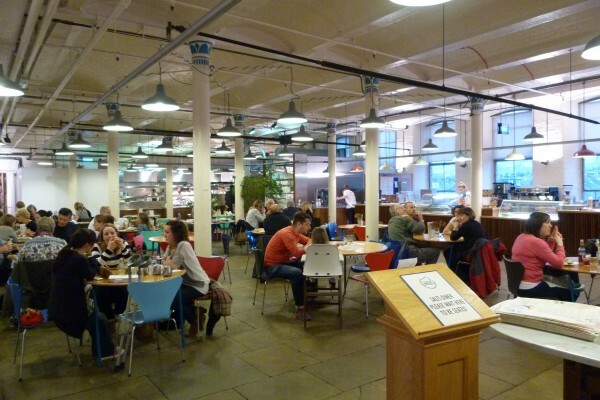 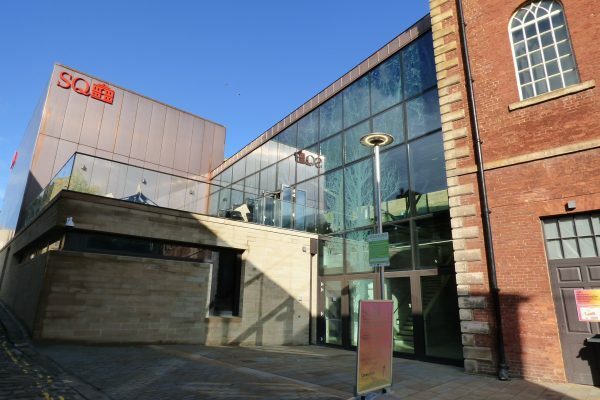 The library houses a Visitor Information Centre and provides direct access to the Piece Hall from Halifax railway station and neighbouring Eureka! 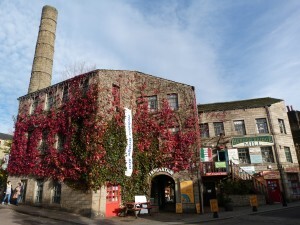 The National Children’s Museum. 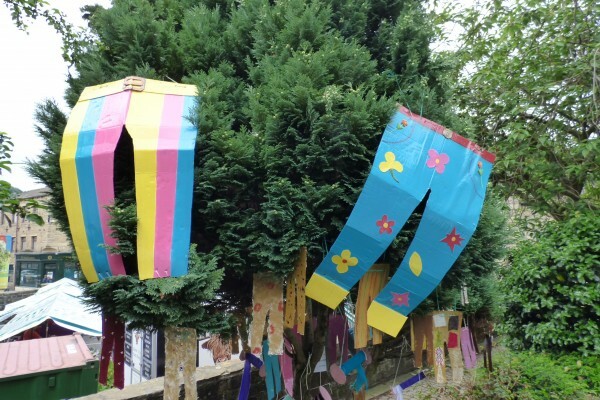 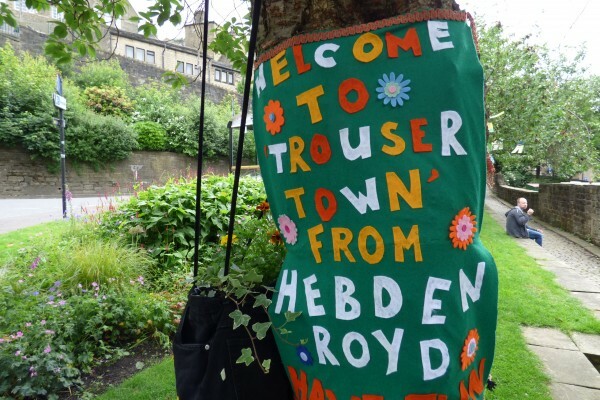 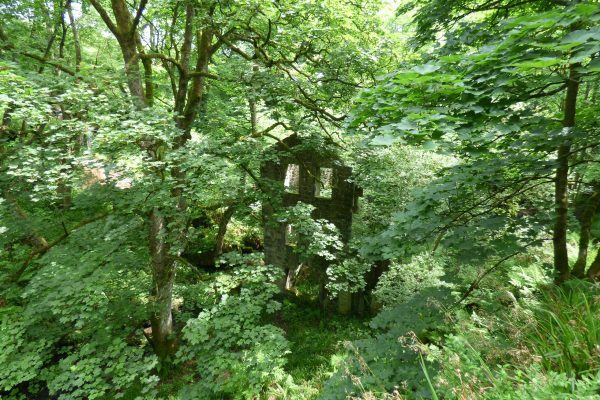 Jumble Hole Clough is one of the many delightful spurs off the Upper Calder Valley near Hebden Bridge. 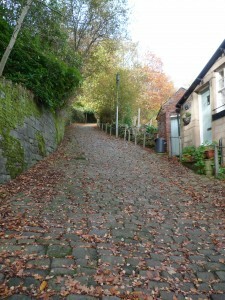 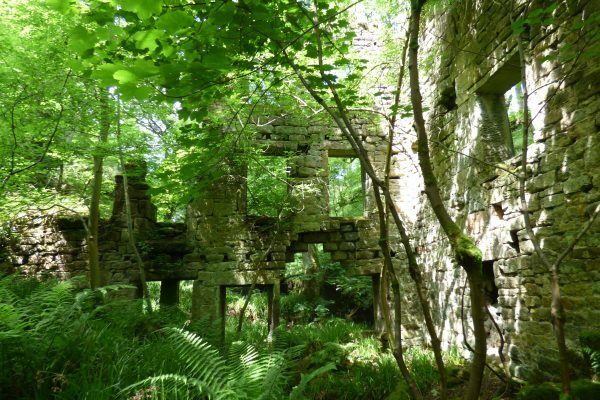 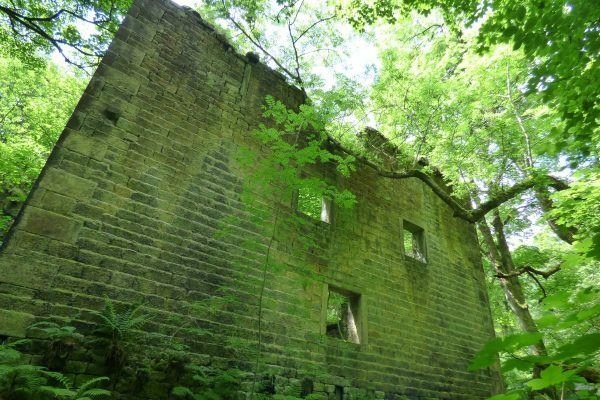 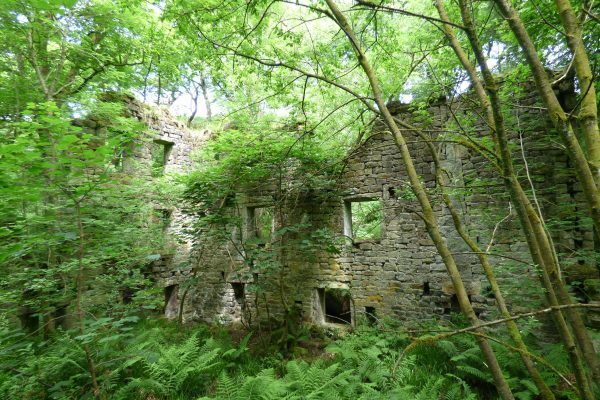 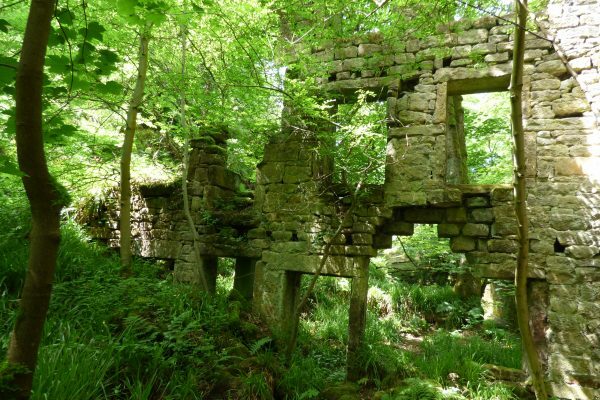 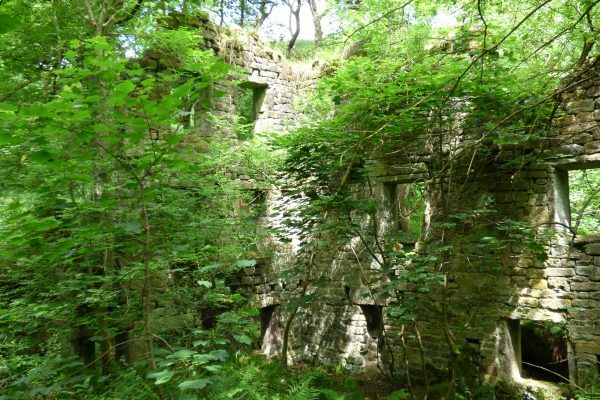 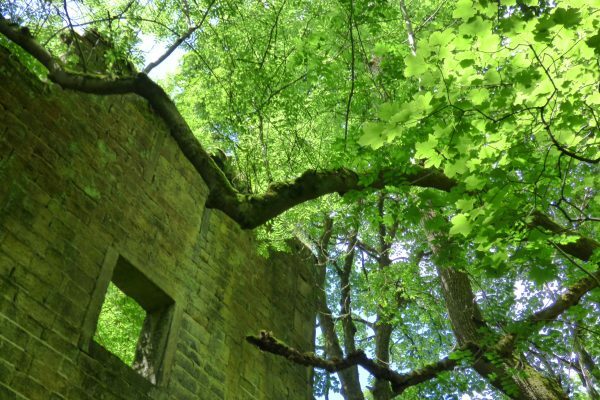 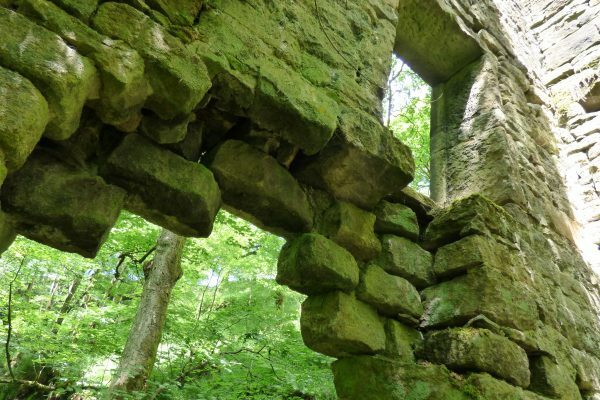 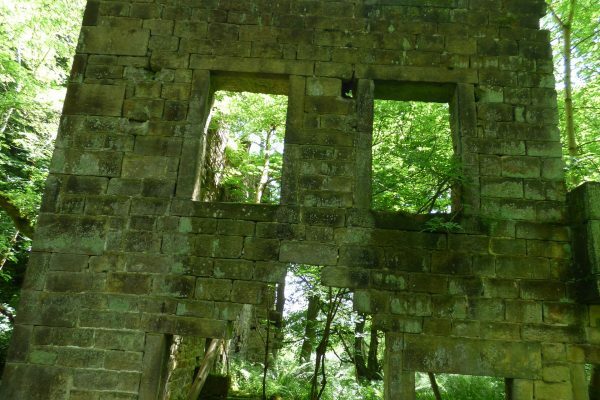 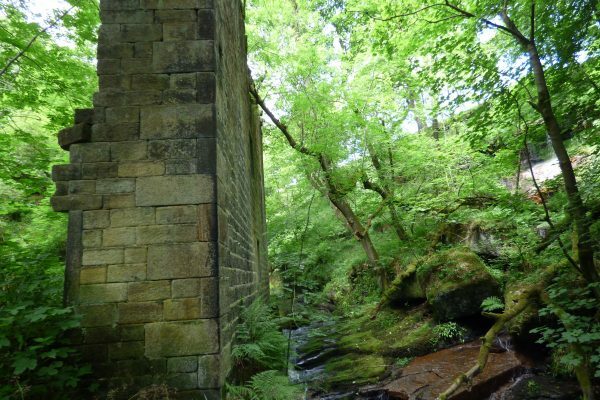 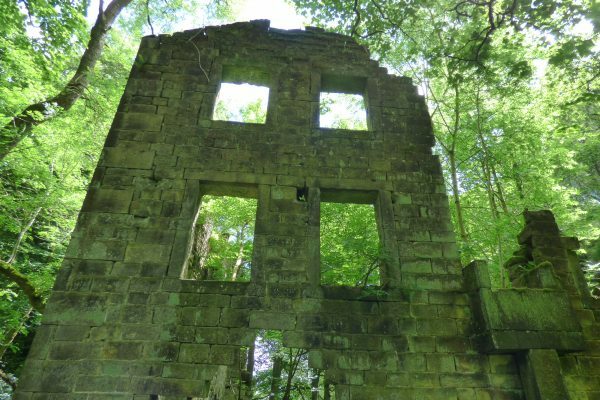 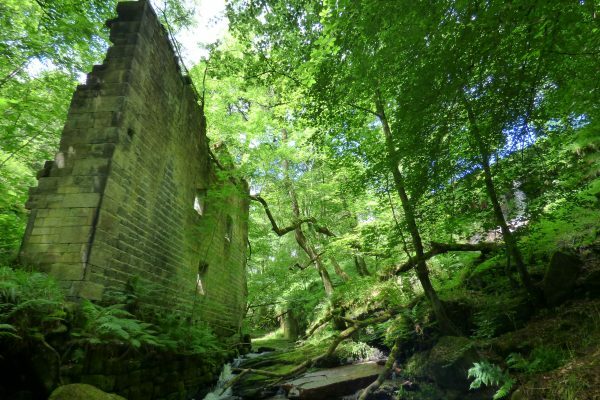 Steep, narrow and densely wooded, it is hard to believe that this was once a hive of industry. 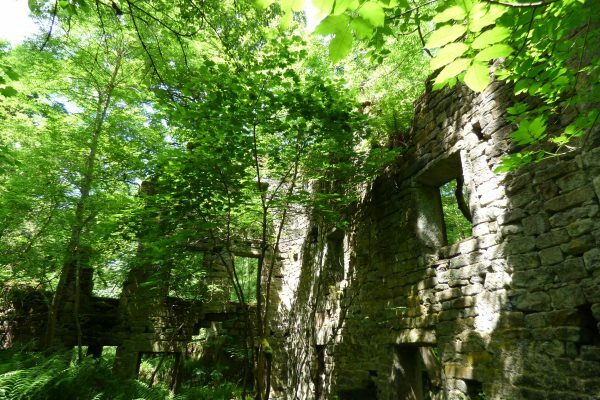 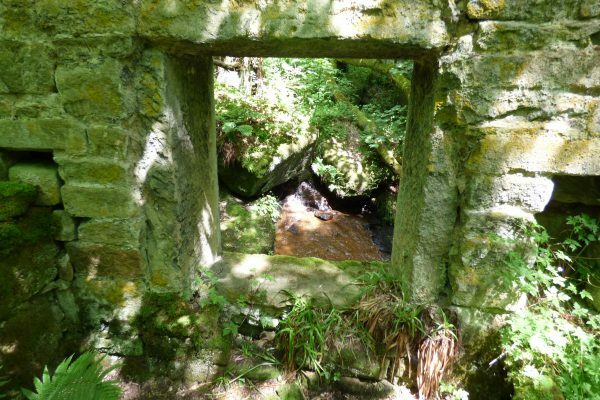 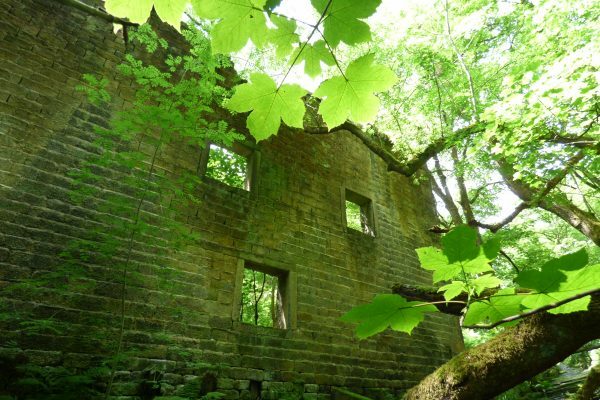 A series of water-powered textile mills once tapped the river running through this valley, including the picturesque Staups Mill, seen in these images. 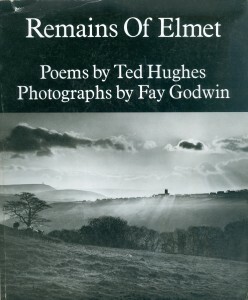 Fay Godwin photographed these intriguing ruins for Ted Hughes’s book Remains of Elmet in the 1970s. 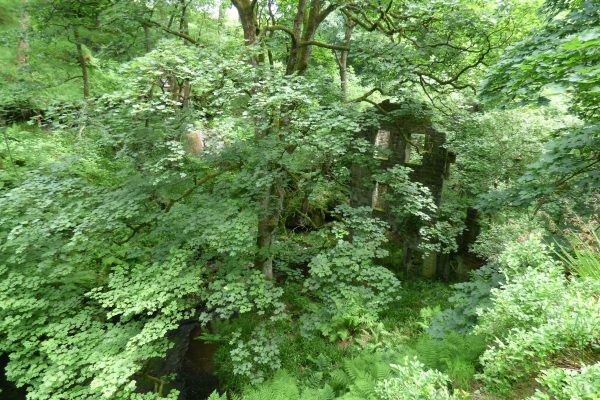 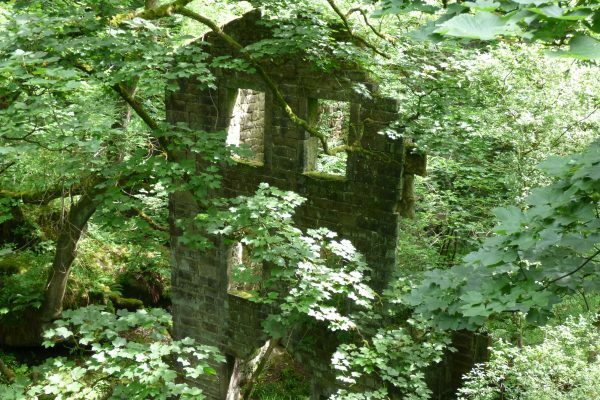 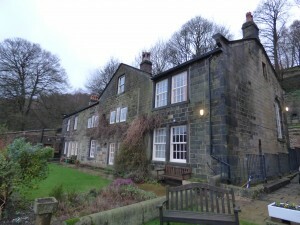 Amazingly, the building is still just about standing, although the clough itself is more overgrown than ever. 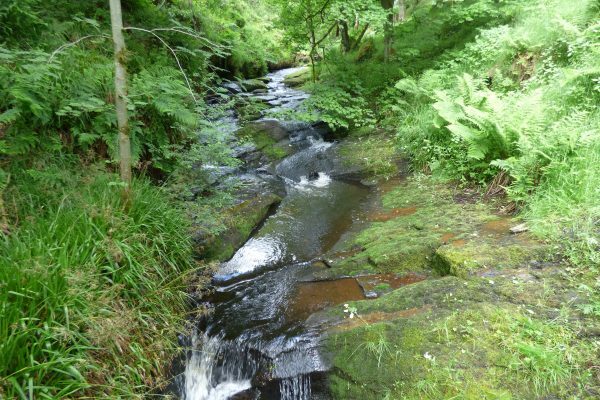 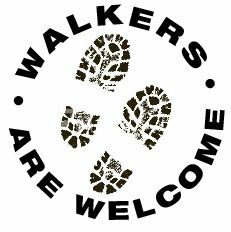 Just one of the hidden gems to be discovered on walks near Elmet Farmhouse.